A sharpened eye, finished UFOs , refashioning, wardrobe deficient identification and self photography fatigue – all side effects of participation in the phenomenon of Me Made May. I was warned, Zoe even mentions some of these in her Me Made May Sign Up posting. 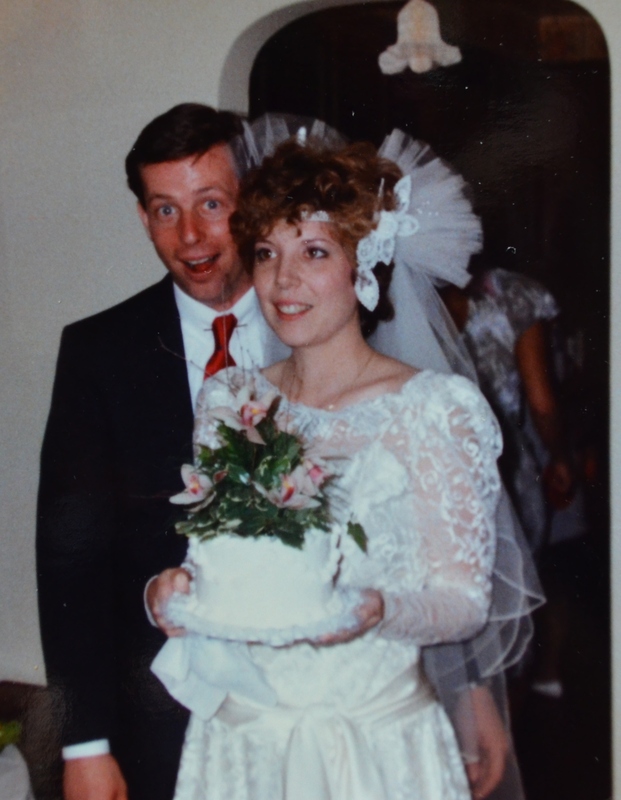 In my first bout of Me Made May, I thought I would be immune. 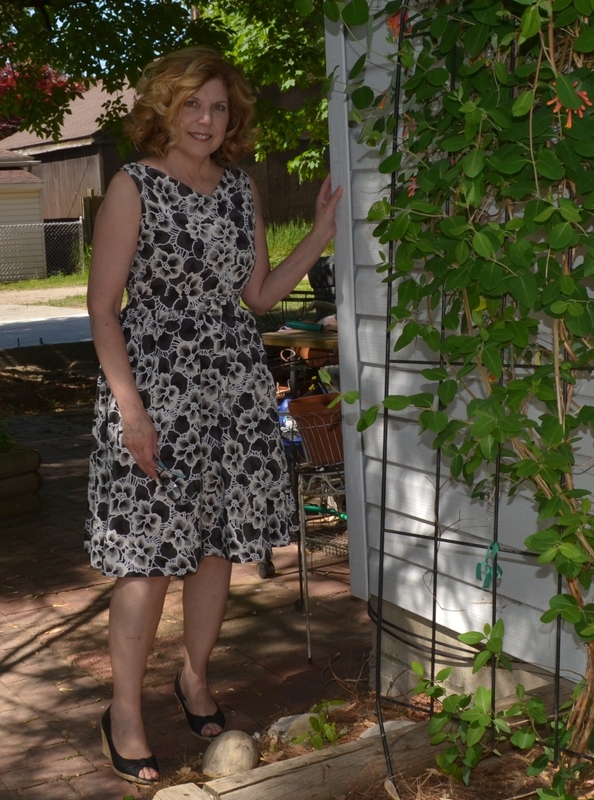 As the month has progressed, I found myself contemplating what was missing from my wardrobe and spending time observing others’ makes on #MMMay15 Instagram, seeking those also afflicted with the love of pretty print dresses. Then I actually found myself pulling out a dreaded UFO. 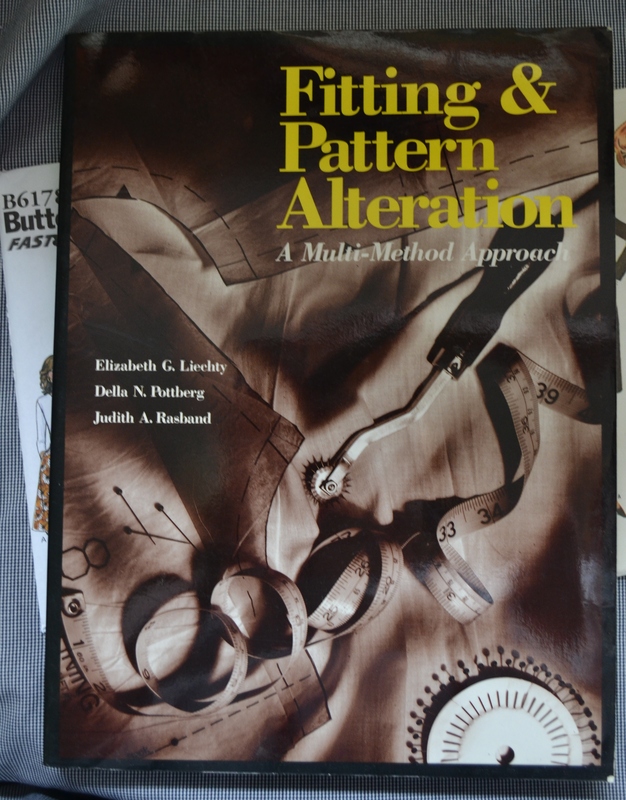 It had hung in the back of my sewing room closet, incubating for nearly a year. 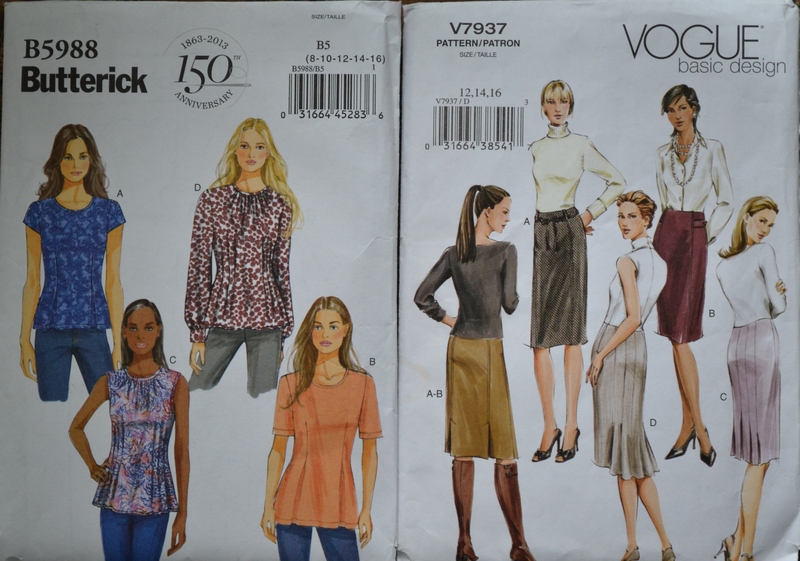 The top, Butterick 5988, was actually fininshed. What! When did I do that? 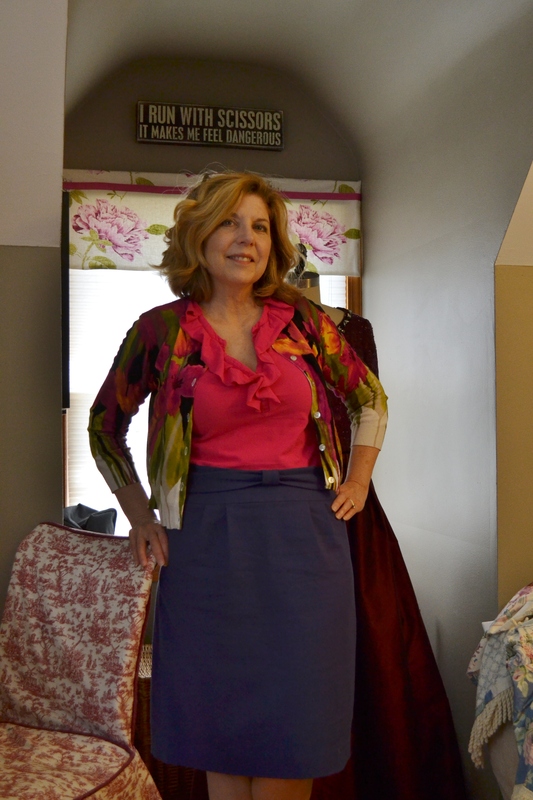 Have you ever had sewing memory loss? 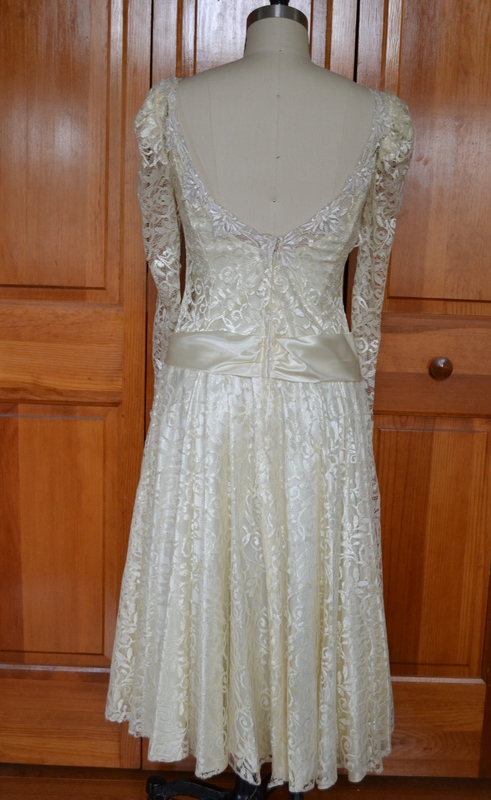 Although it looks fine on the dress form, somehow on me it didn’t look quite right. Maybe that’s why it had been cast aside. 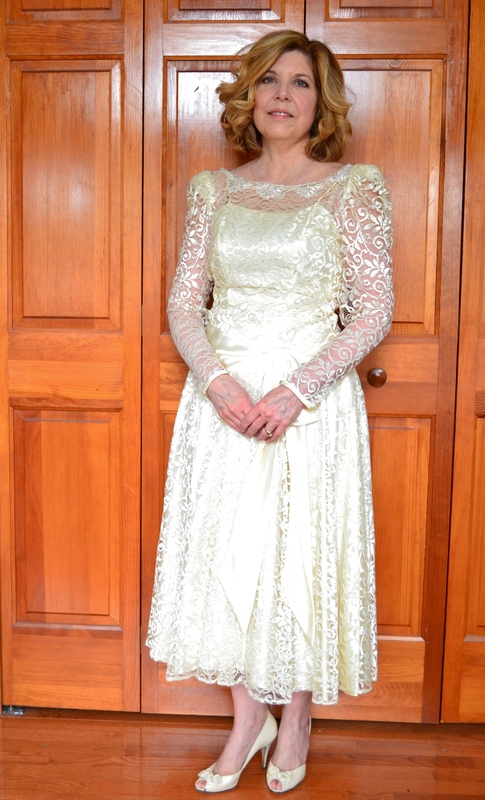 Was it the neckline or maybe the cap sleeves? Just what could be the diagnosis? 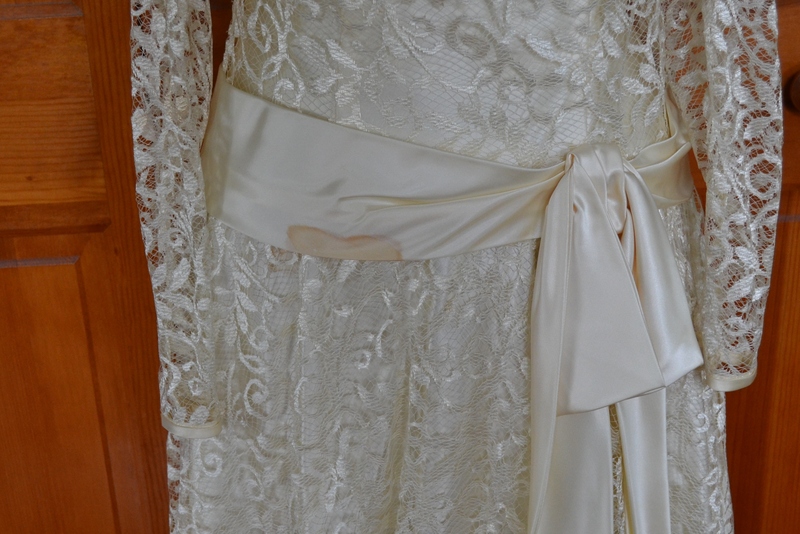 Further examination revealed it needed 4 inches amputated from the hem. Short people may need proportion adjustments. 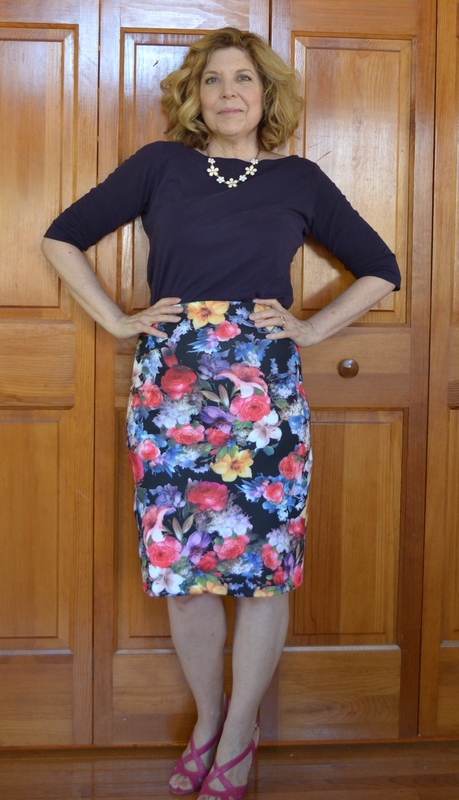 Having a top end too low on the hip just makes you look even shorter. It had to be chopped off and was instantly much cuter for it. 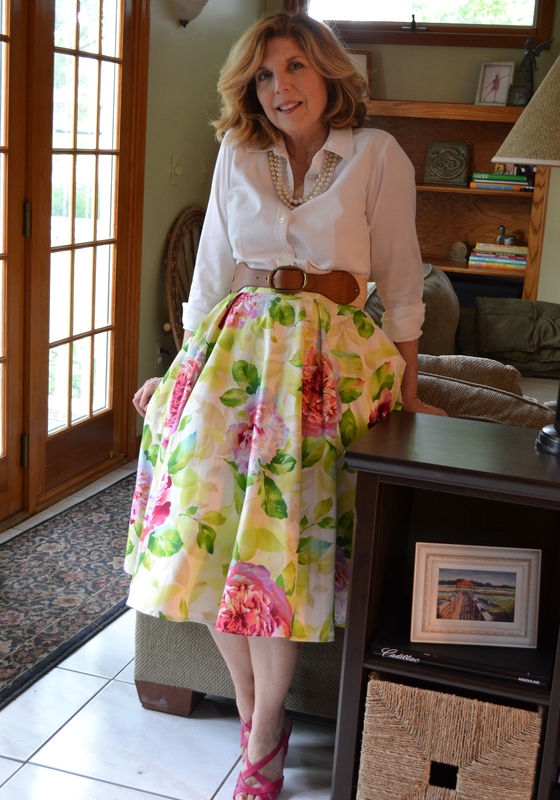 The skirt was a copy of a RTW skirt from Loft, hacked from Vogue 7937. 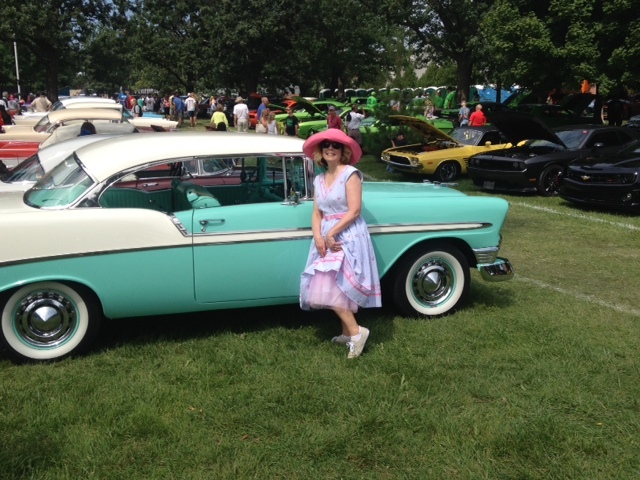 I had changed it to a single back vent and added the partial yoke in the front and back. 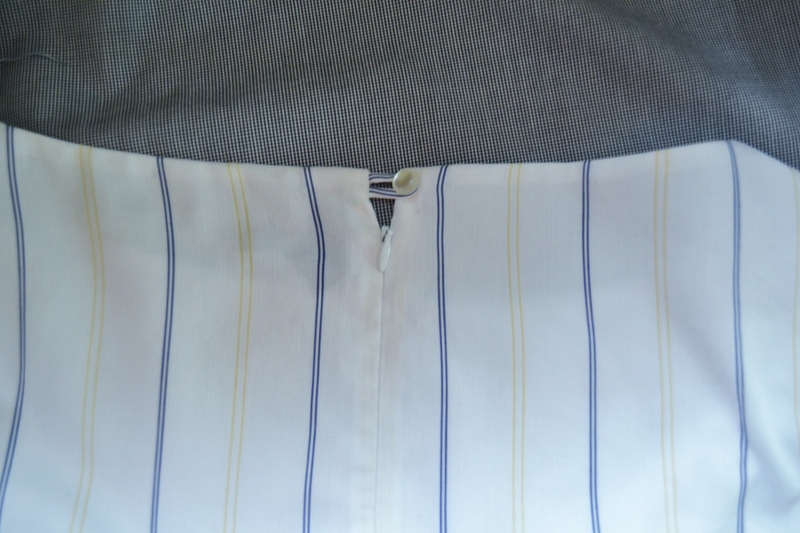 Although the yoke doesn’t show when wearing this top, it helps the fit. 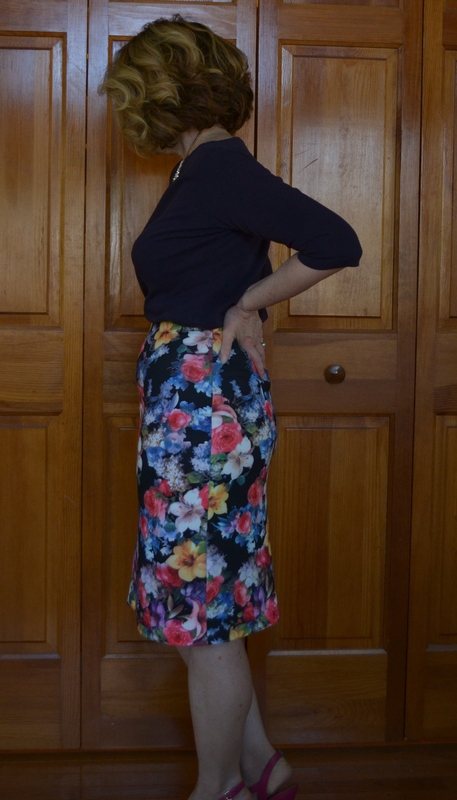 The skirt needed to be taken in on the sides, a petersham waistband added and a hem. 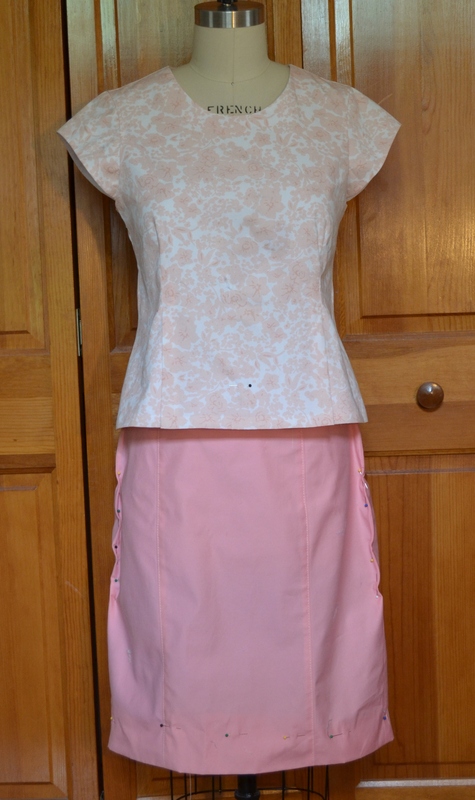 In all just an afternoon to finish the outfit. Photographing took almost as long. Michigan has an abundance of cloudy, rainy days, our pale faces are seeking the sunlight, along with a location to get some decent photos. 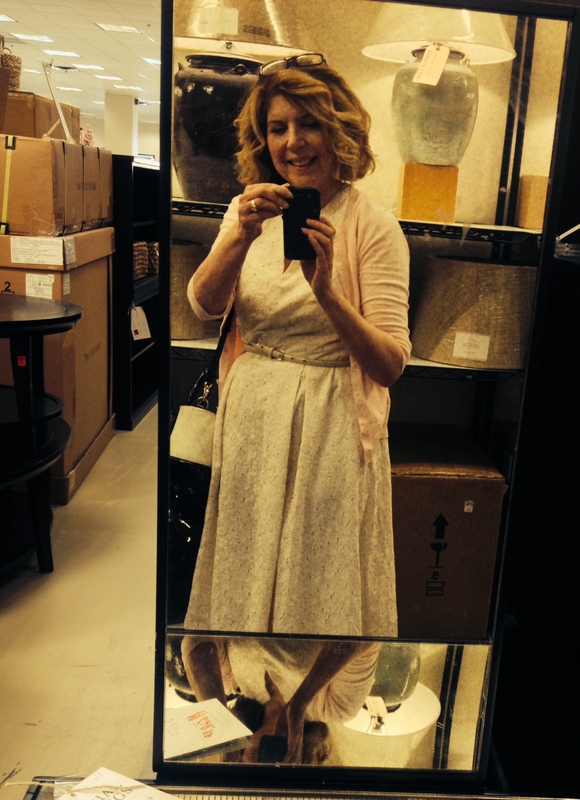 My affliction continues with another attempt to refashion. 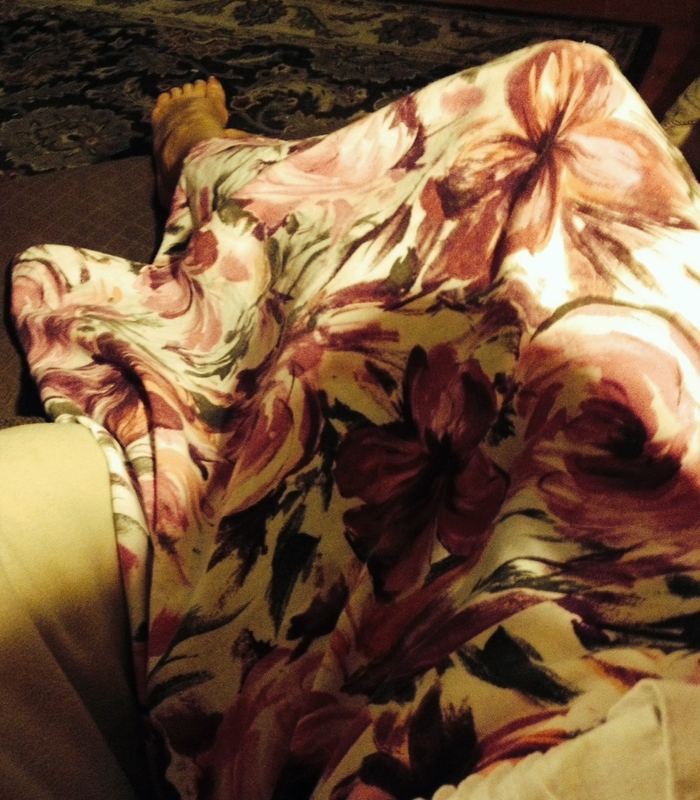 A skirt my sister passed along. 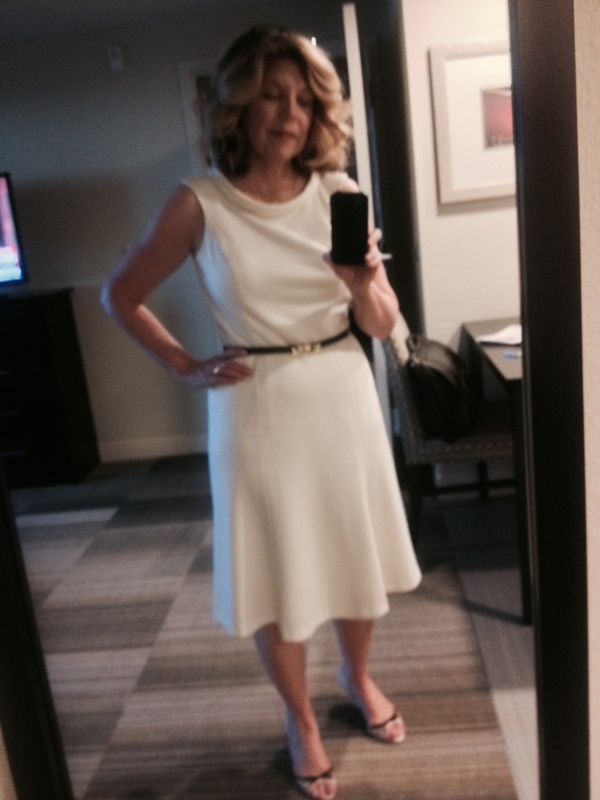 She said it looked dowdy on her and she is four inches taller, so it really looked dumpy on me. 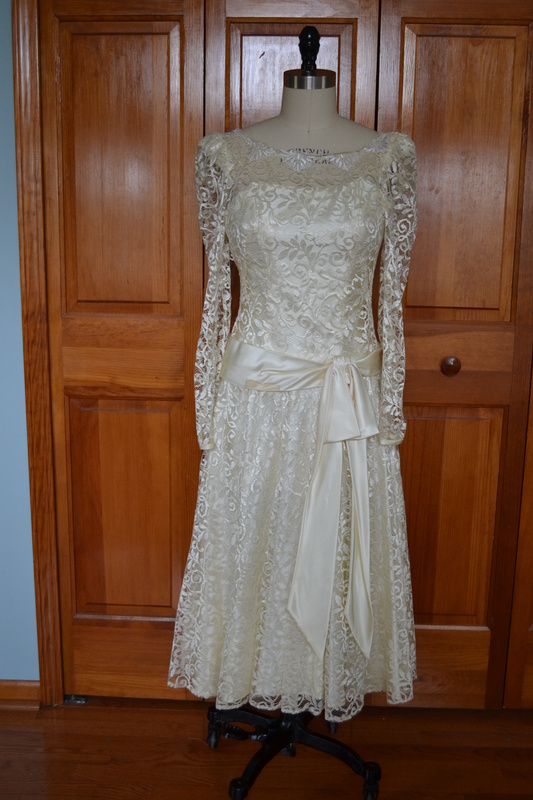 There’s a lot of lace there, once I get it all unpicked. Darn those RTW seam finishes. I’m also following a lot more bloggers, Instagramers and Pinterest boards now. Yikes, how contagious is this? 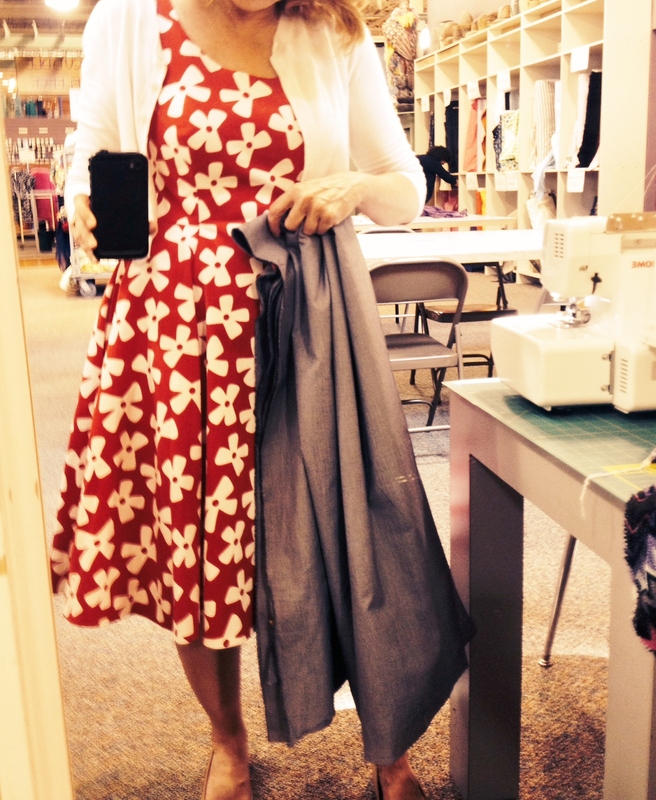 What’s Me Made May doing for your sewing? 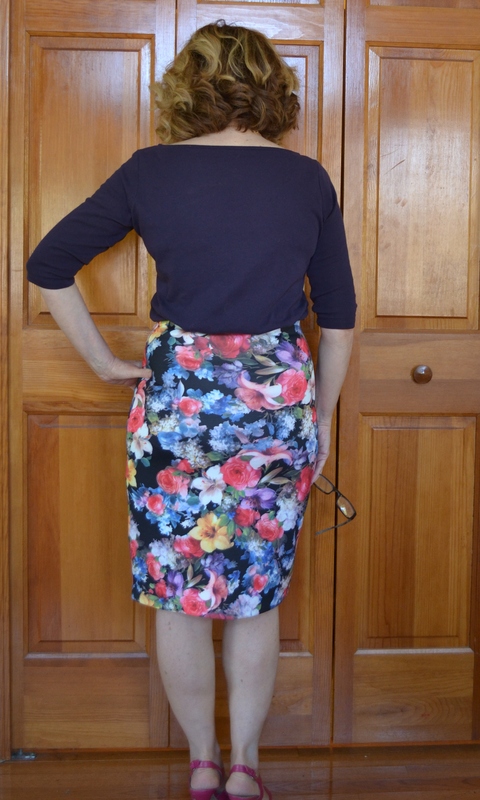 Day 14 – Skirt Simplicity 2315 in broadcloth, made 4 or 5 years ago. 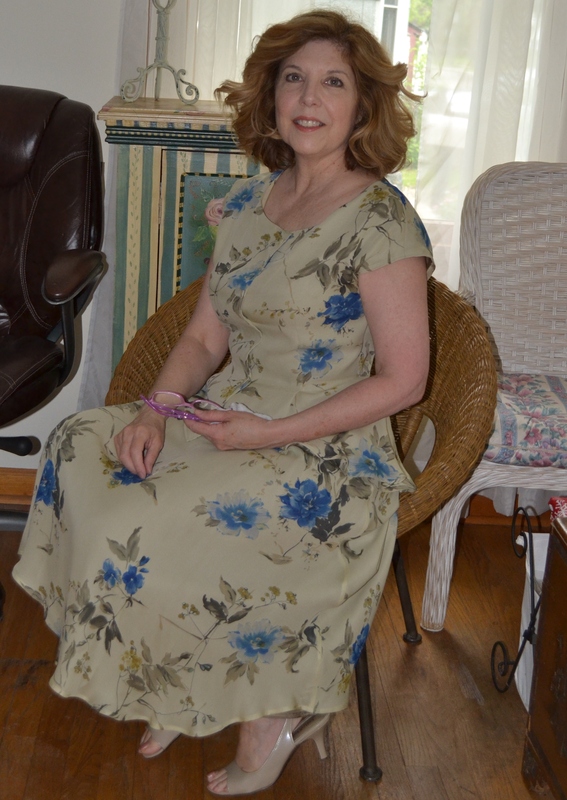 I, Denise Dooley of sewingforward.com sign up as a participant of Me-Made-May ’15. 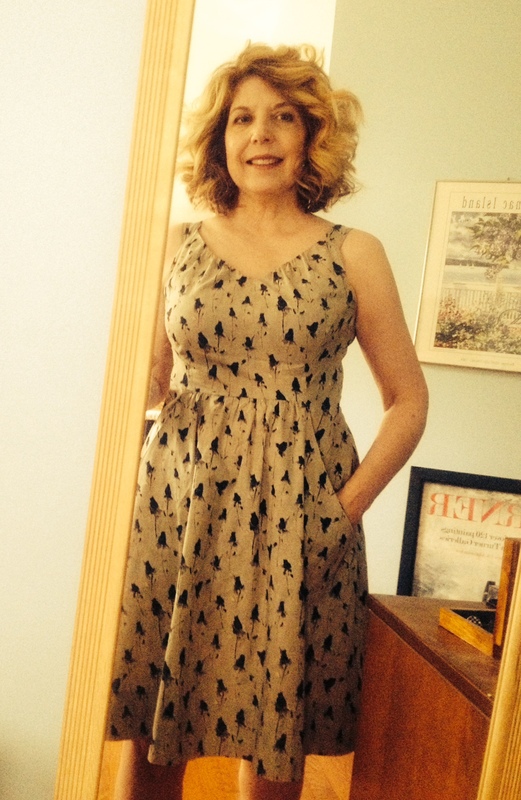 I endeavour to wear one me-made garment each day for the duration of May 2015. In previous years, seeing others Me Made May projects was inspiring, and I was always impressed with so many makes. 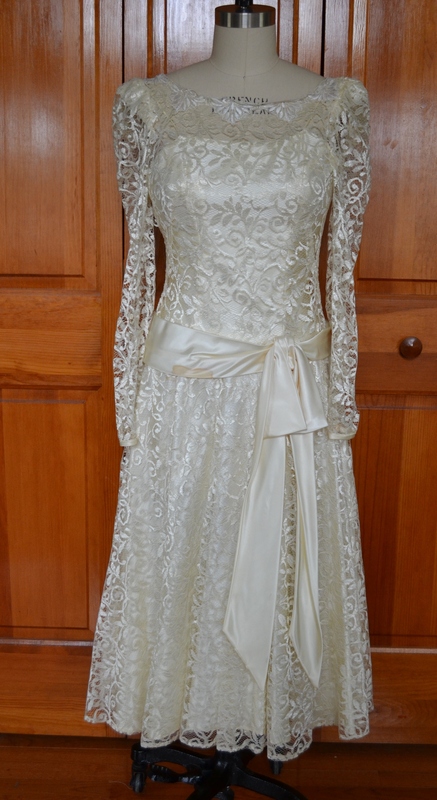 This is my first year as a participant, finally having enough Me Made clothes. 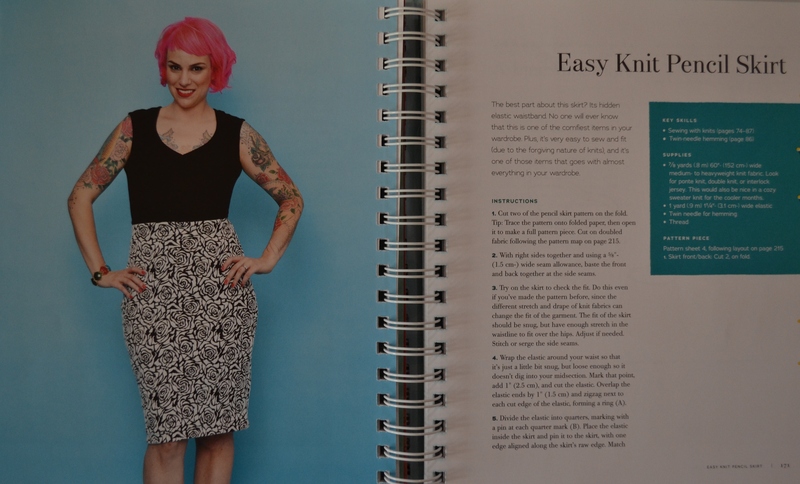 Focusing lately on making more casual wear, I just made the easiest skirt ever!The Easy Knit Pencil Skirt from the Gertie Sews Vintage Casual book. No darts, no zipper. 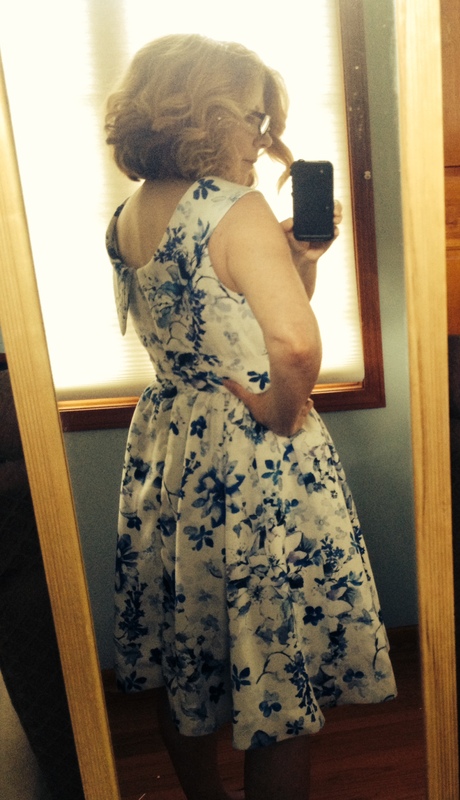 It’s 2 seams, elastic and a hem, but it can show off the right fabric. 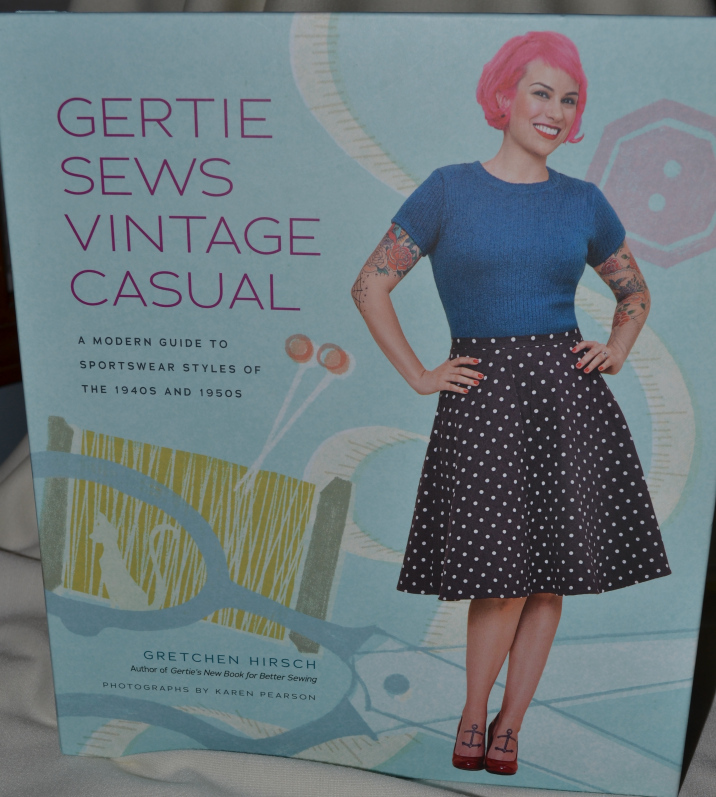 Gretchen was wearing this skirt when she signed my book at the http://www.americansewingexpo.com/ last year. 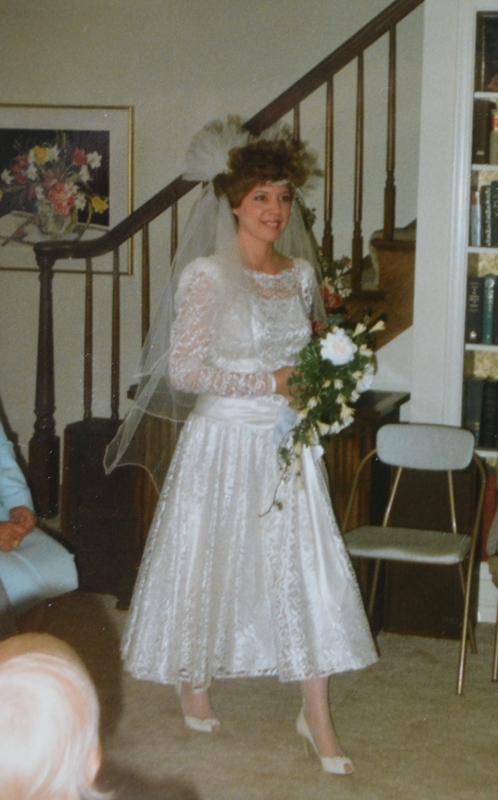 The fabric was gorgeous and it looked great on her. Based on the measurements, I traced off an 8. 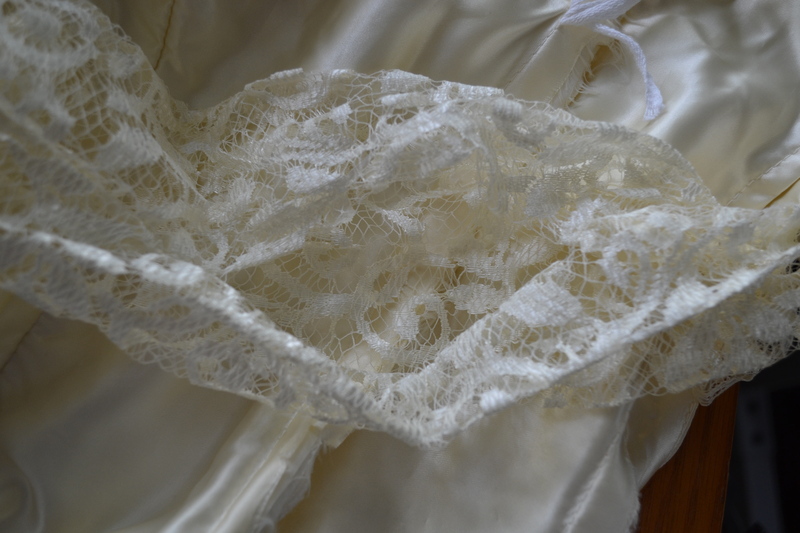 The first attempt was wearable muslin, with a little twist. 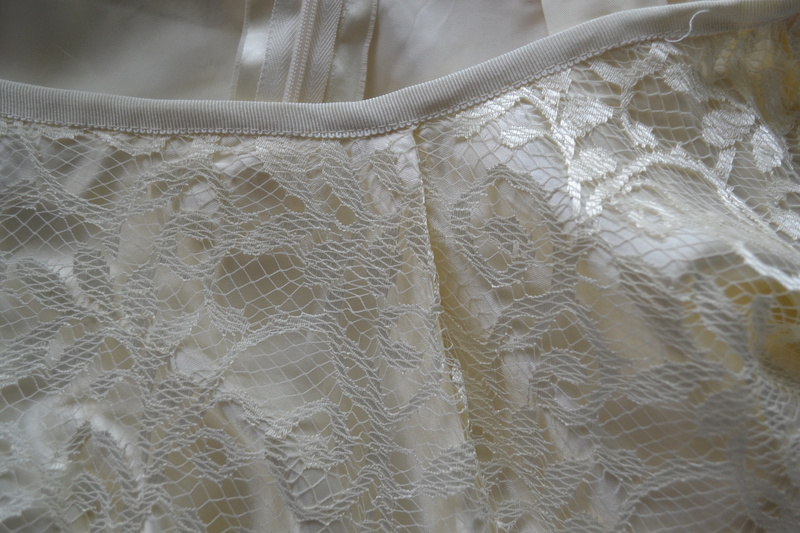 The fabric for the muslin was a power mesh meant to be used in shapewear. 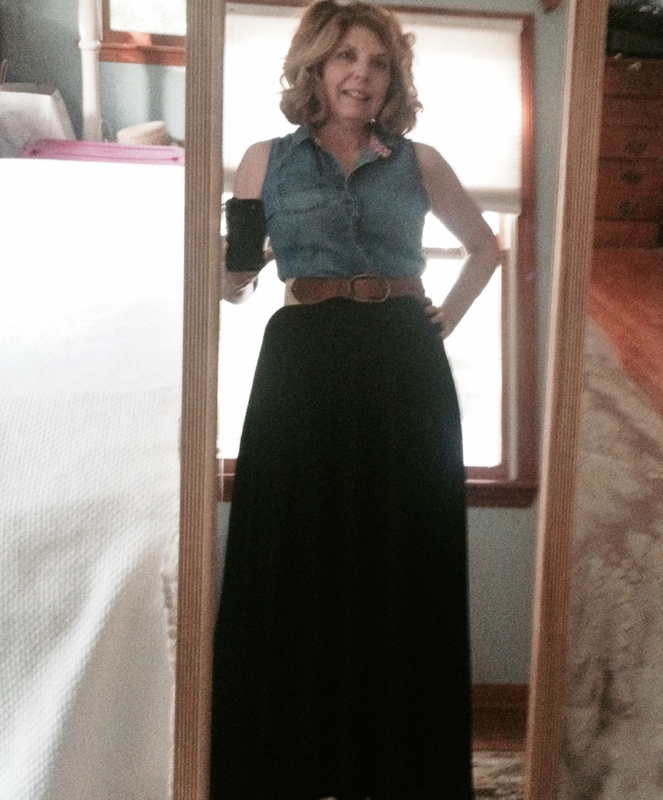 If I was going to wear this body hugging skirt, a little support was in order. 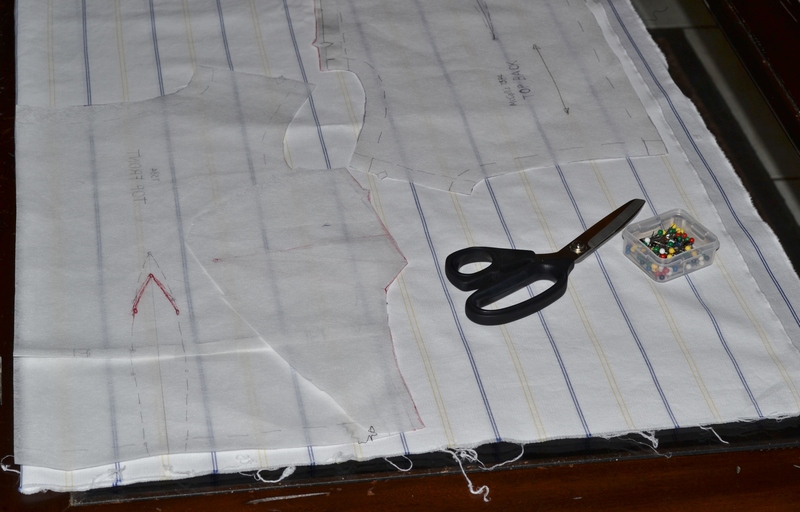 Laying out the pattern on the center fold to remove about 1 1/2 inches, I was hoping for a body firming fit. 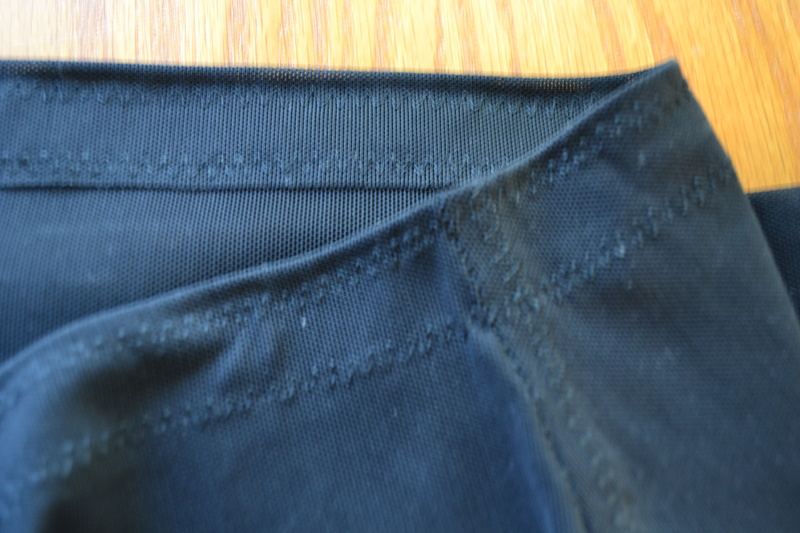 With the side seams basted, I found the pattern had just a little more curve at the upper thigh than I do. 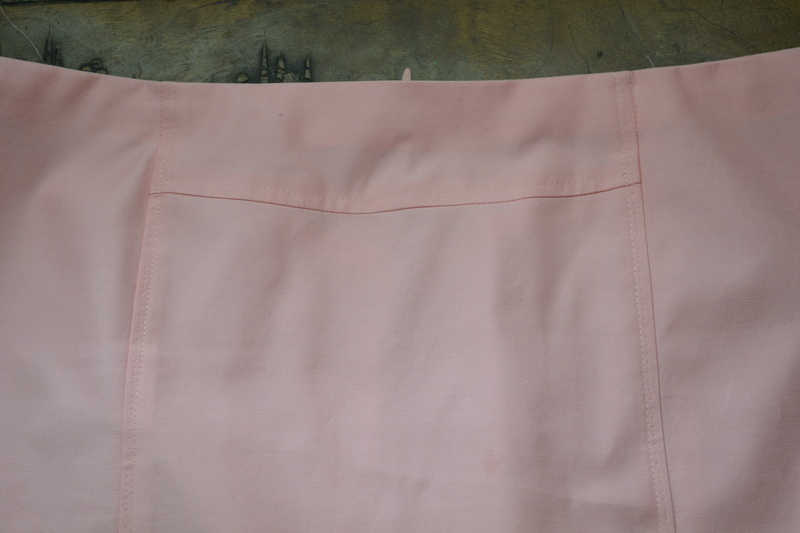 The waist and hips were a good fit, I just graded the seam in 1/4 inch along the thigh. 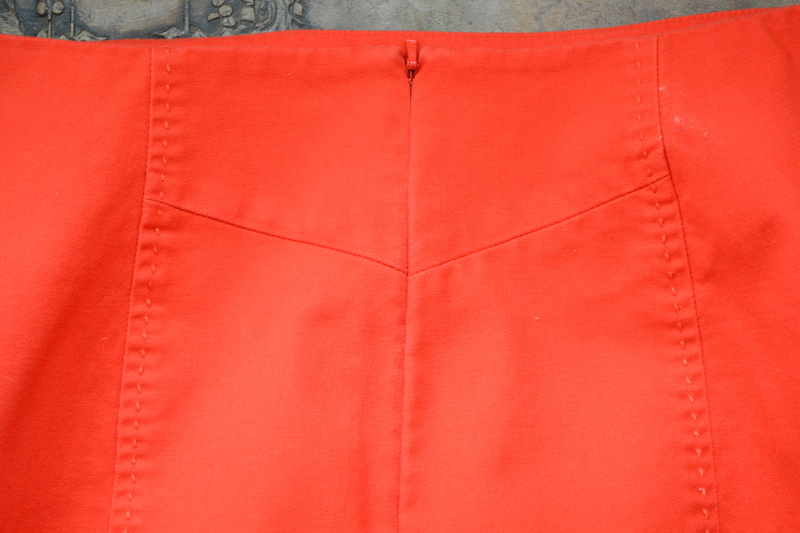 After sewing the side seams with a stretch stitch, I pressed the seams to one side and zigzagged the seam allowance down. 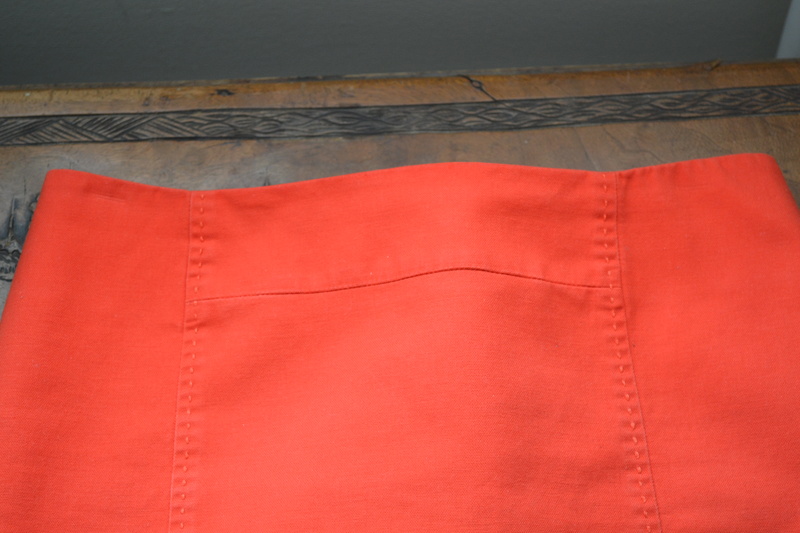 The waist and hem were just folded over and zigzagged. 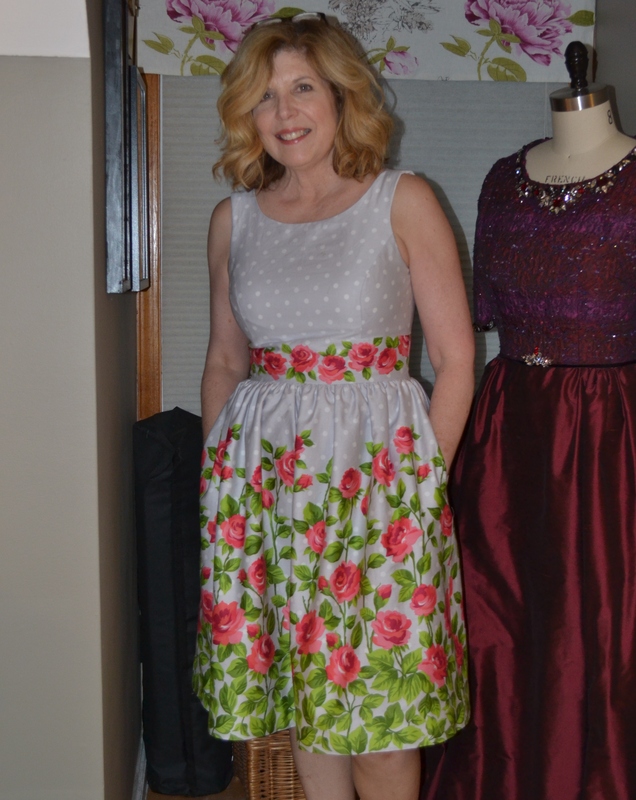 Since the fabric was already all stretch, with a snug fit, I did not add elastic at the waist. 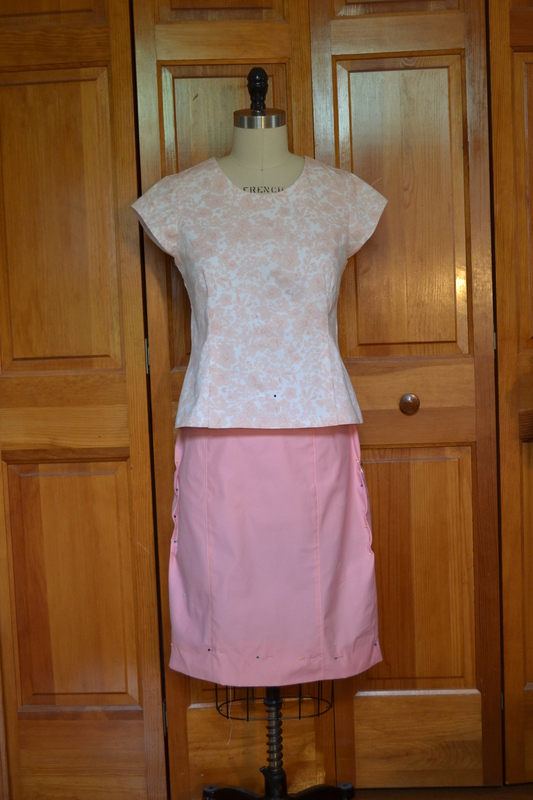 With the support wear done, I moved onto the skirt. 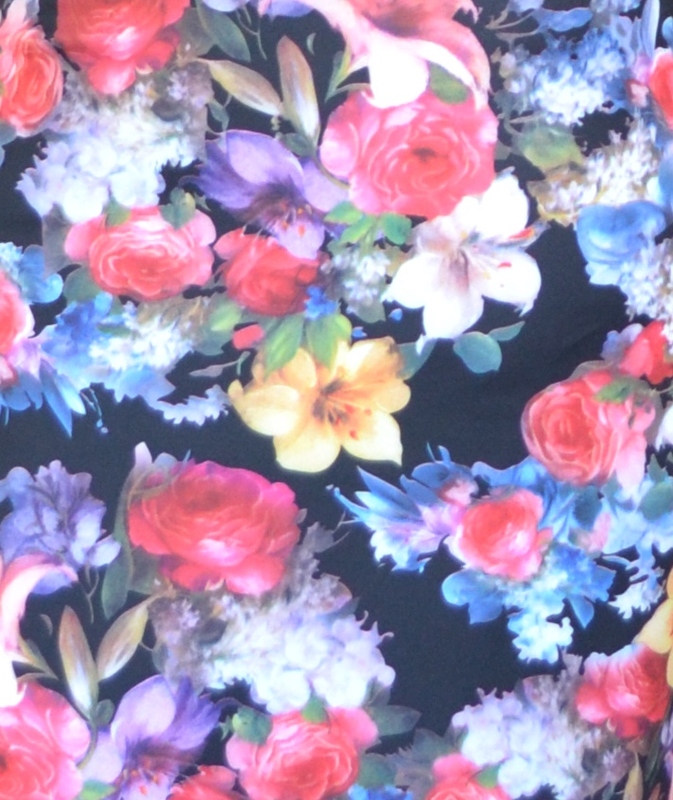 The fabric is a could not resist it, digital print neoprene from Haberman Fabrics. 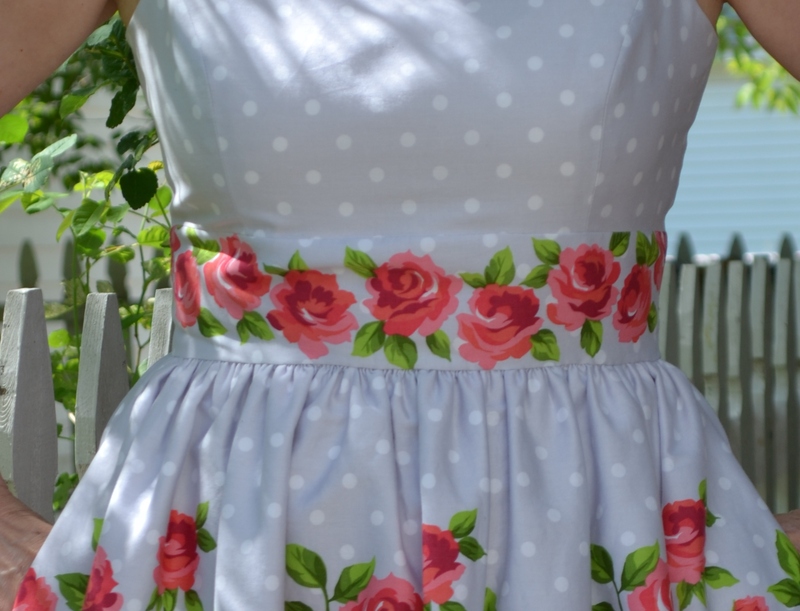 It has a nice stretch, no raveling and is easy an easy sew. 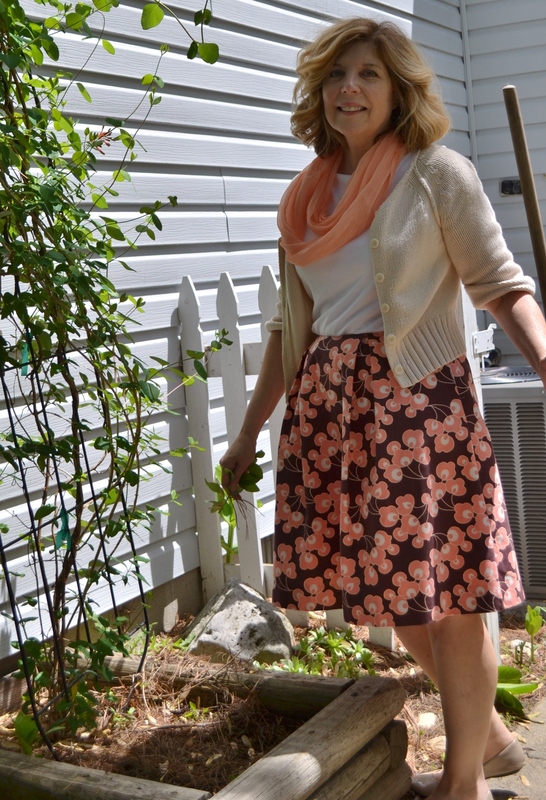 It only took 3/4 of a yard to make the fastest skirt ever. 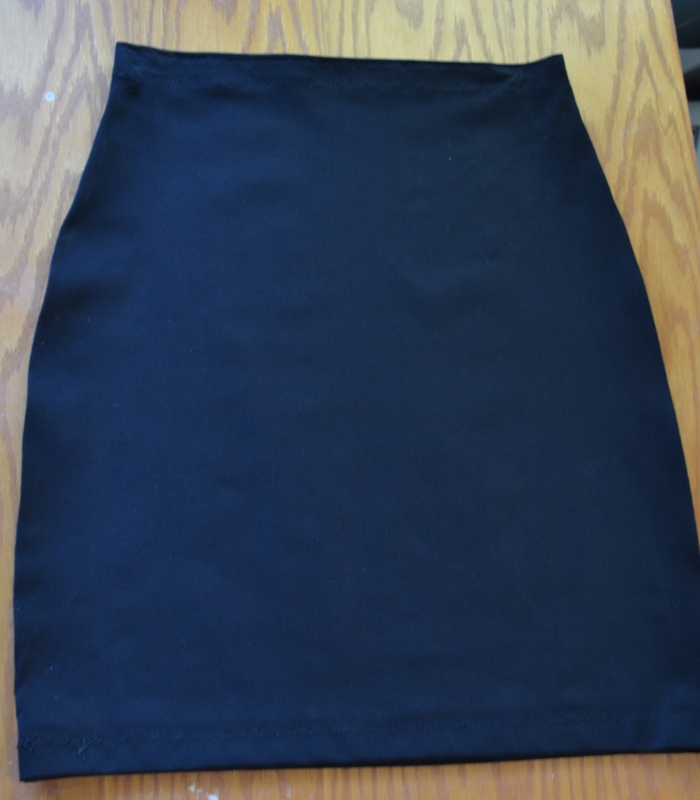 I cut the skirt with the size eight, just grading out the 1/4 inch at the thigh. 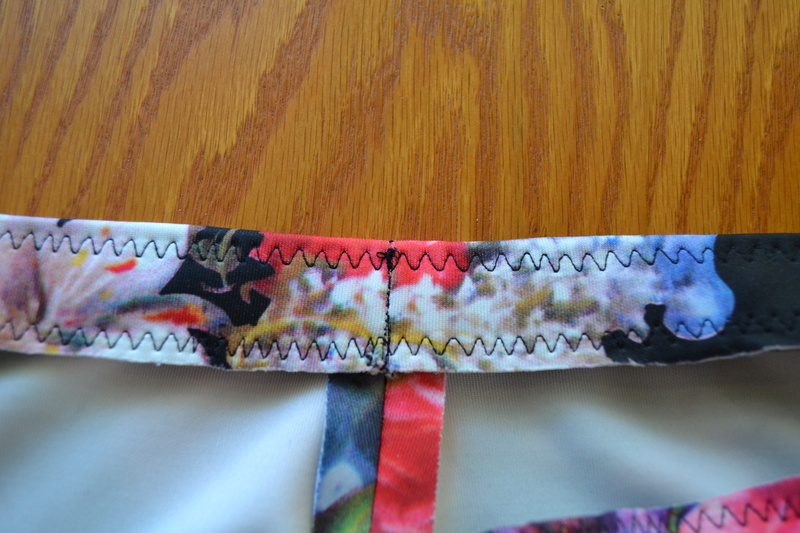 Then sewed the side seams with a stretch stitch, pressing the seams open. 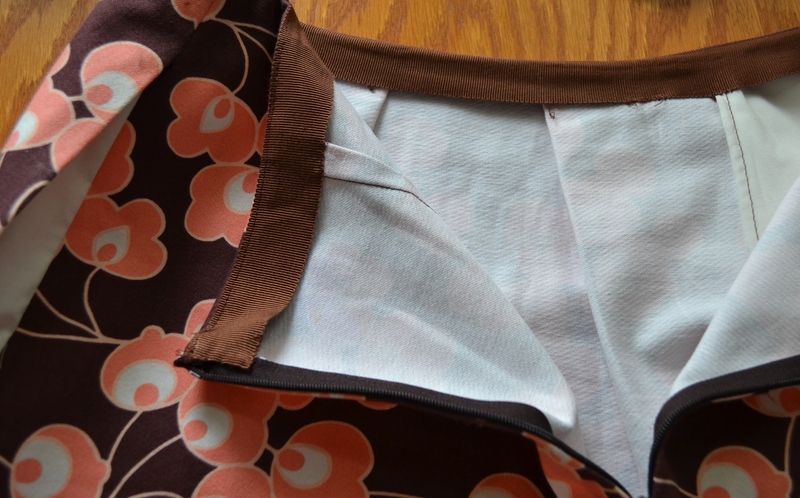 To finish the waist, elastic zigzagged to the inside folded over, then tacked down by stitching in the ditch of the side seams. 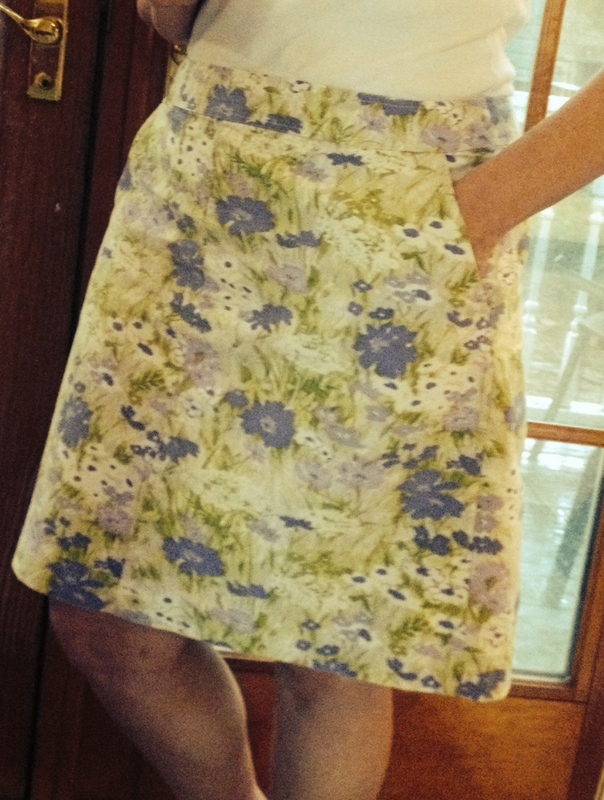 Add the hem and the skirt is done. 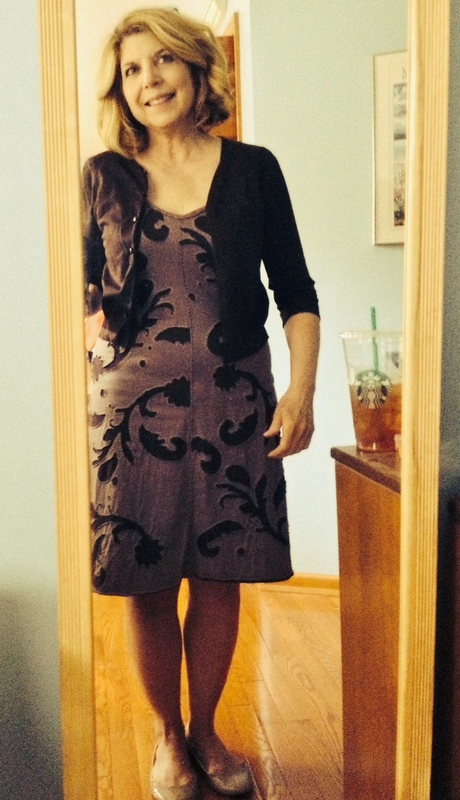 This was my day 1 outfit for Me Made May. 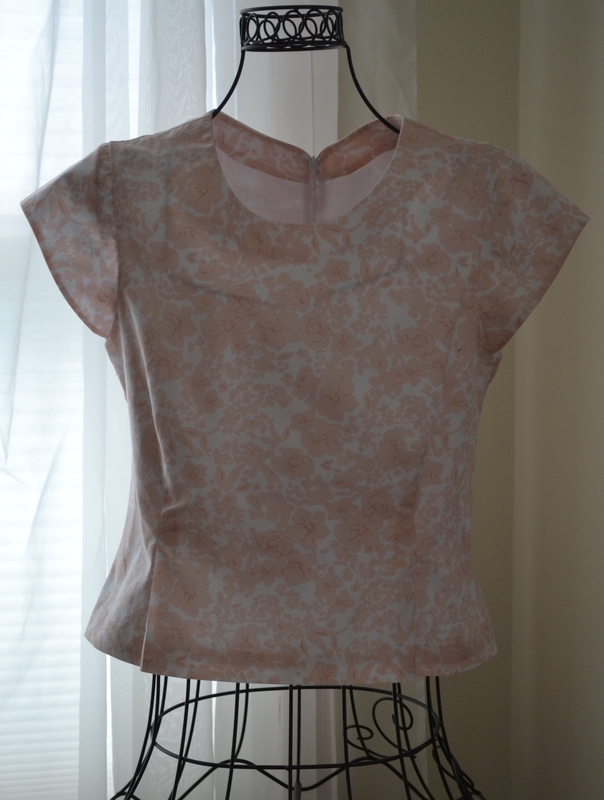 The top was a wearable muslin of the Boatneck Top, also from the same book and almost as fast to make. 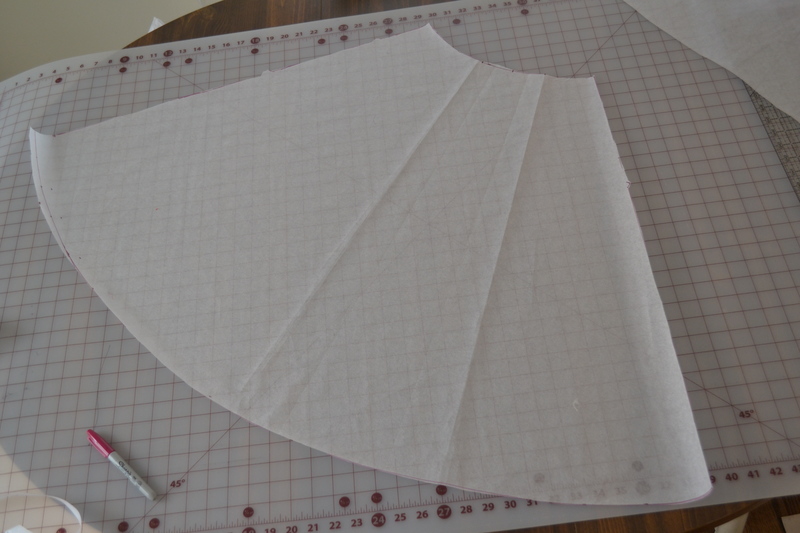 I used the size 8, but my second version I cut with 1/2 inch removed from the center fold line for a better fit. The hardest part of Me Made May has been getting photos each day, I’m getting pretty tired of myself. 30 days of this, really? 10 days down, 20 more to go. 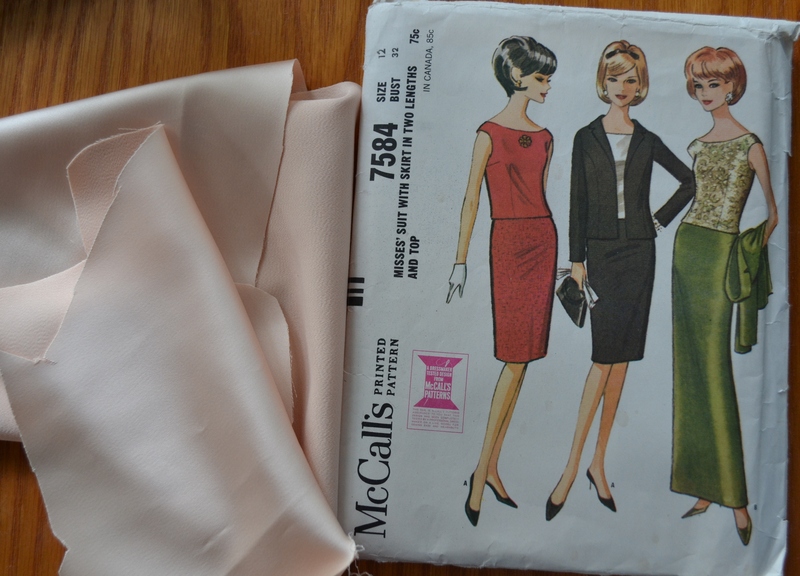 Day 2 – Skirt- refashioned wedding dress, Top – vintage 1964 McCalls 7584 in stretch satin from Haberman Fabrics, Royal Oak, MI. 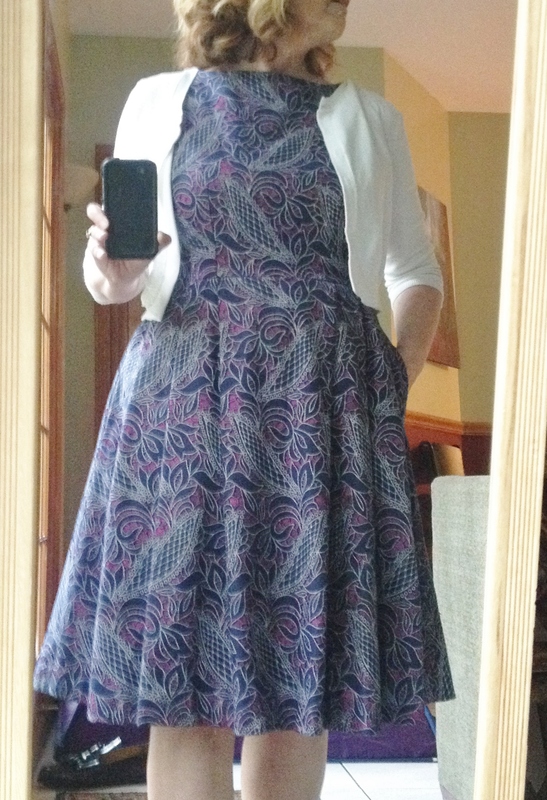 Day 3 – Combined Vogue 8766 and 5982 in cotton from Satin Moon, San Francisco. 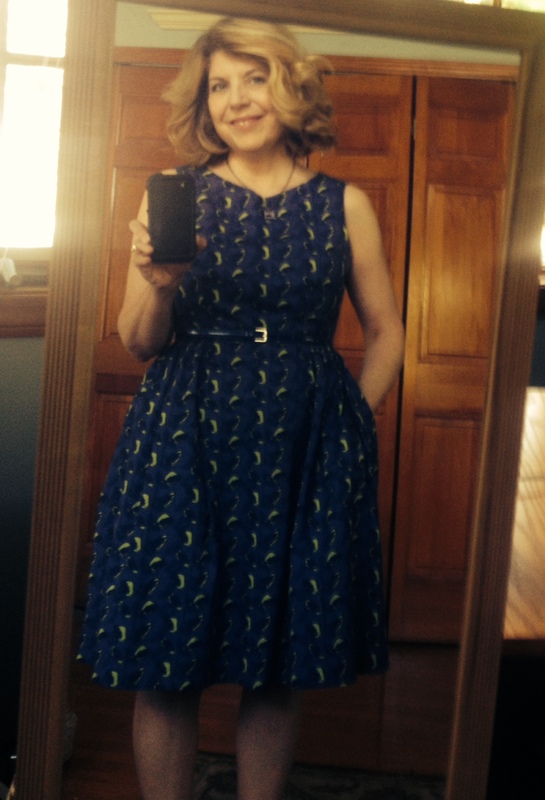 Day 5 – Pattern Review Winter Street Dress in poly knit from Haberman Fabrics. 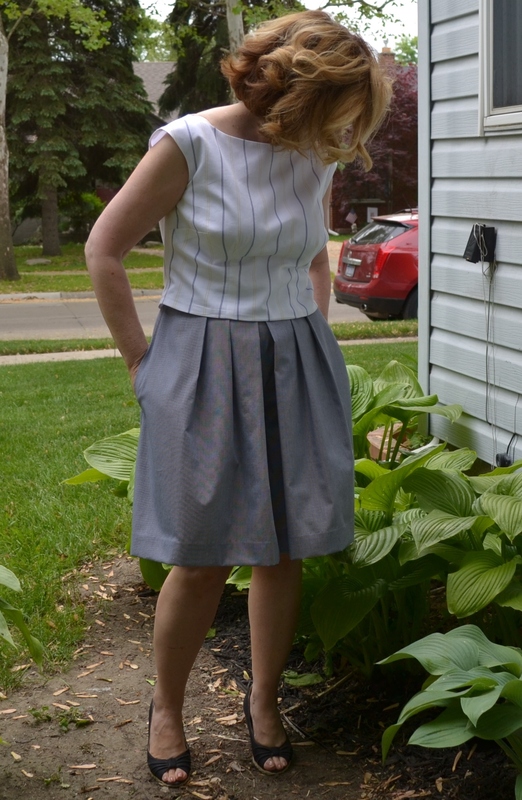 Day 6 – Self drafted skirt in poly-cotton from JoAnn. 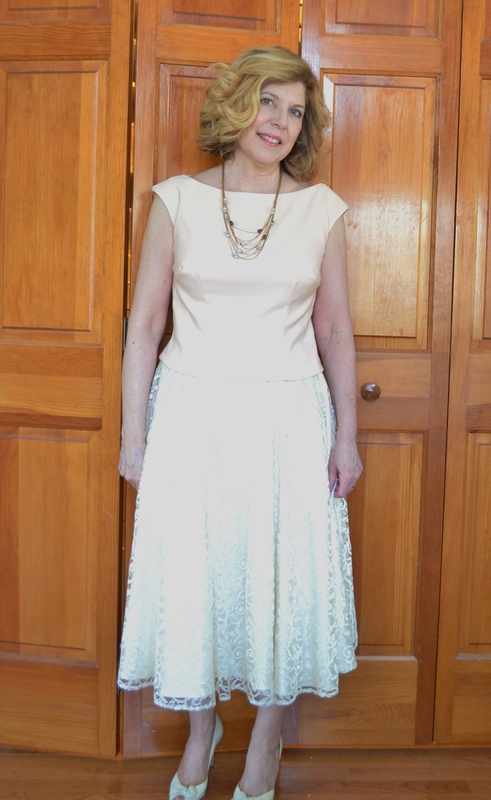 Day 7 – Vogue 8993 in embroidered eyelet from Mood Fabrics. 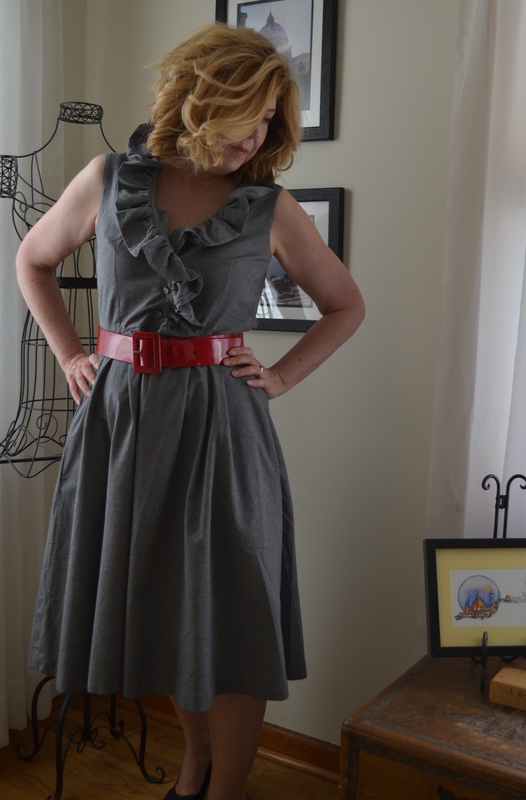 Day 8 – Shirtwaist dress from Gertie’s New Book for Better Sewing in black chambray from Fabric.com Changed the collar to a ruffle. 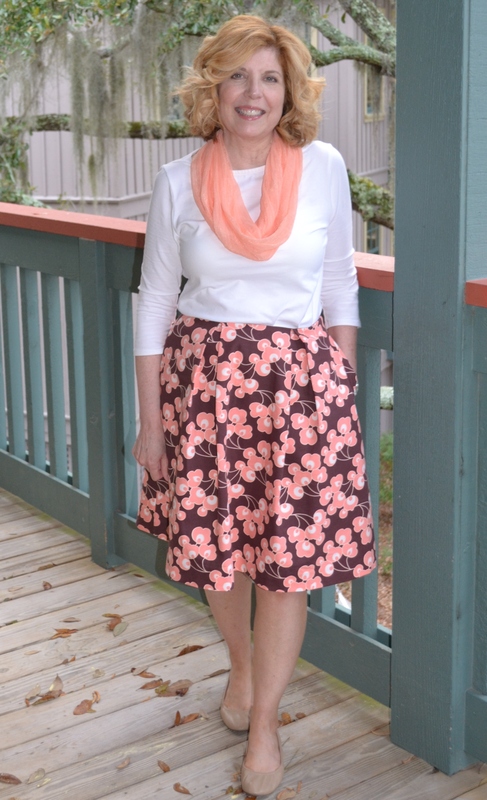 Day 9 – Simplicity Threads 2592 in cotton from L.A. 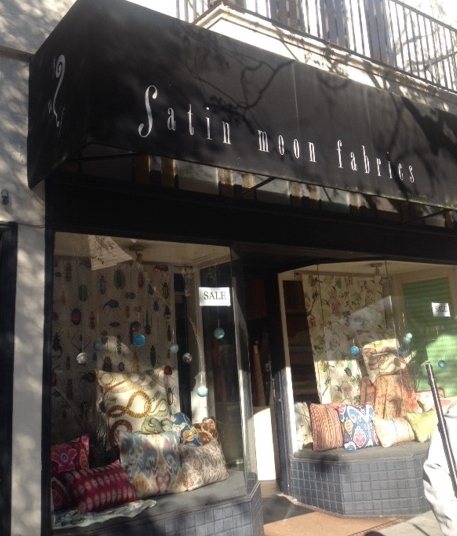 Fabrics, Toronto. 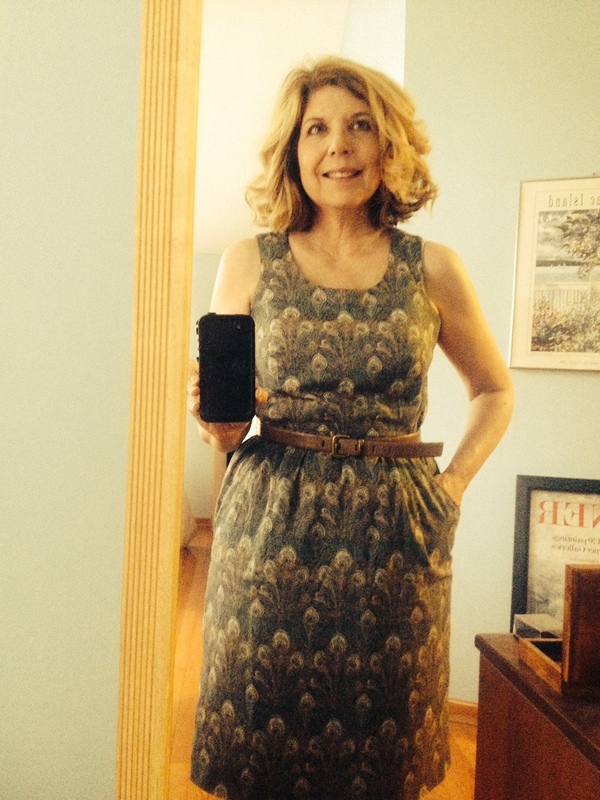 Day 10 – Vogue 8998 in poly blend from Haberman Fabrics. 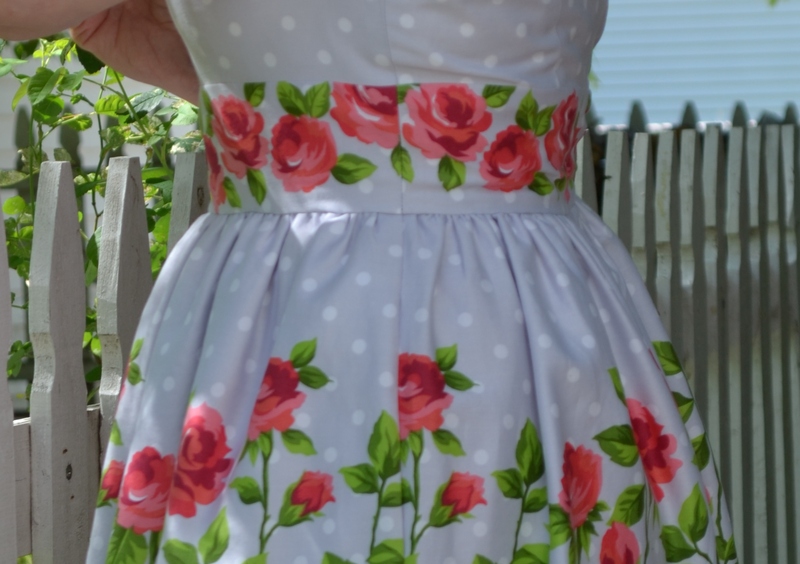 The best part of Me Made May has been seeing so many great makes on blogs, Pinterest and Instagram. Leave me a link if you’ve been posting. There was no vaccine and I was not immune to the bite of the spring cleaning bug. 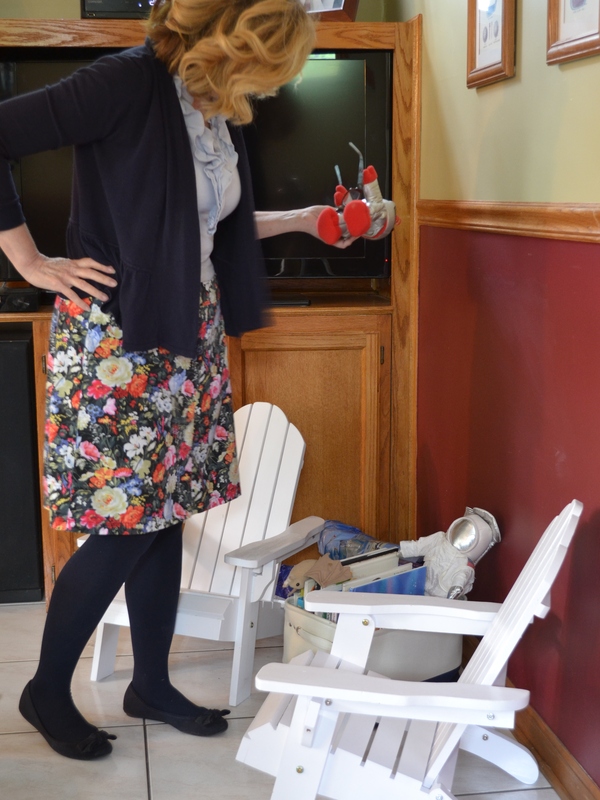 After spending much of the fall and winter trying to sort through my mother’s years of art, craft and sewing accumulation, the bug became highly contagious, passing back and forth between my sister and I. When she bought us both copies of The Life-changing Magic of Tidying Up by Marie Kondo and it became a full blown epidemic. 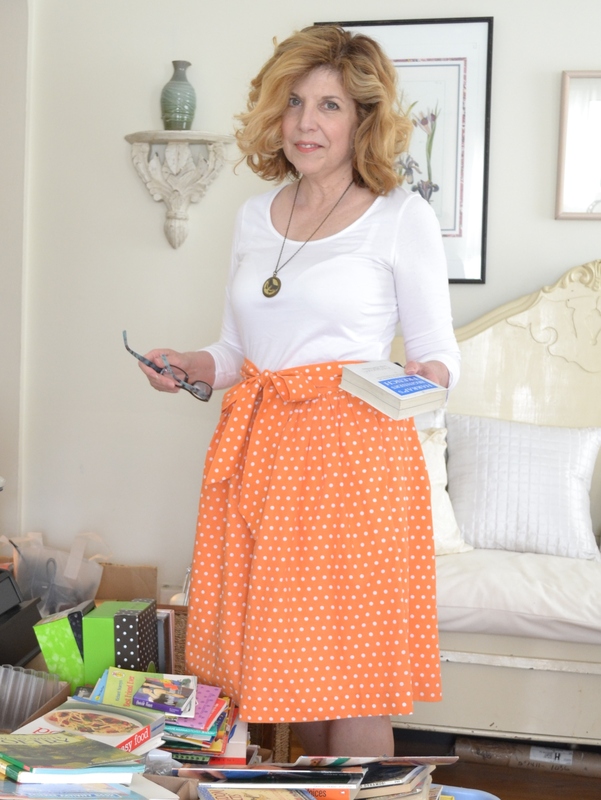 Since the book has been written about on many blogs, you may already know calling it “Tidying Up,” may be a little misleading. 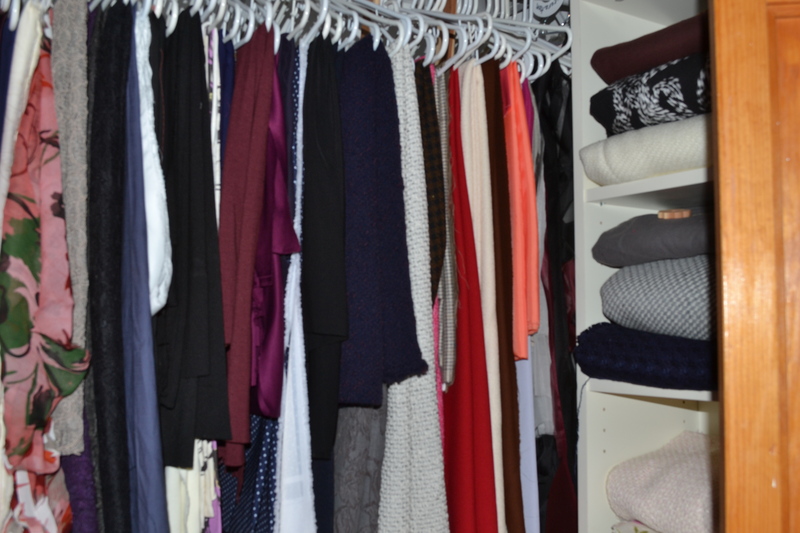 It is really about getting rid of our excess and keeping only what “sparks joy.” Instead of doing a room at a time, Marie Kondo breaks your work into categories, beginning with clothing, then books, papers, miscellaneous, and saving mementos for last. You gather all items from each category all together, which gives you a good visual impact of just how much stuff you have. It’s is eye opening. 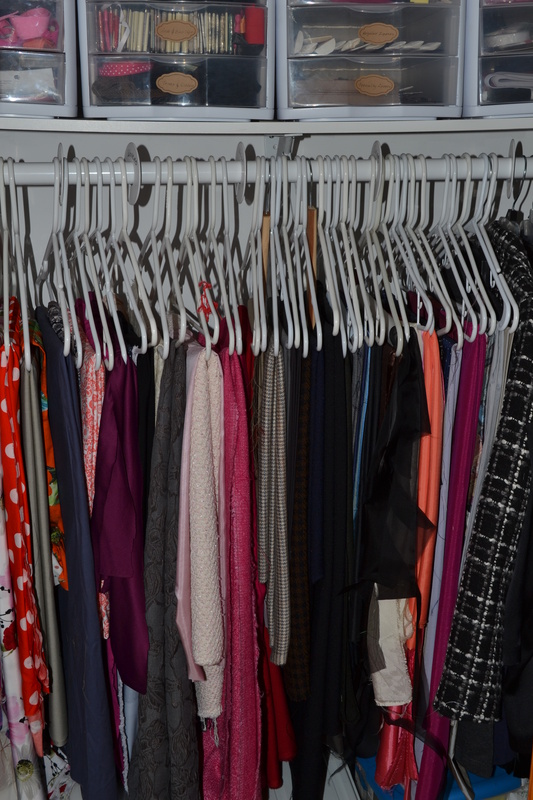 Starting with clothing and breaking it into sub-categories, such as tops or skirts, you handle each item and evaluate if it brings you joy. I asked myself if I was excited to wear something, or just keeping it because I thought I should. This really worked. 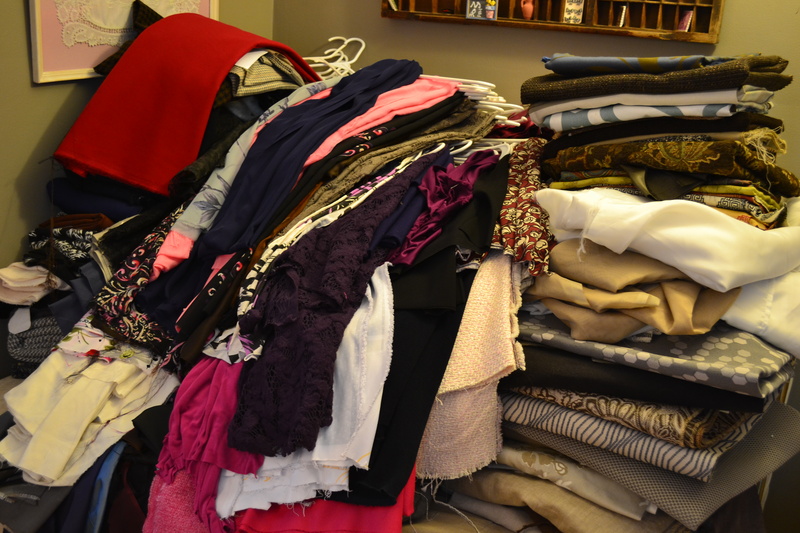 Here is what I purged just from clothing, shoes and bags. Yes, I even purged some things I made. 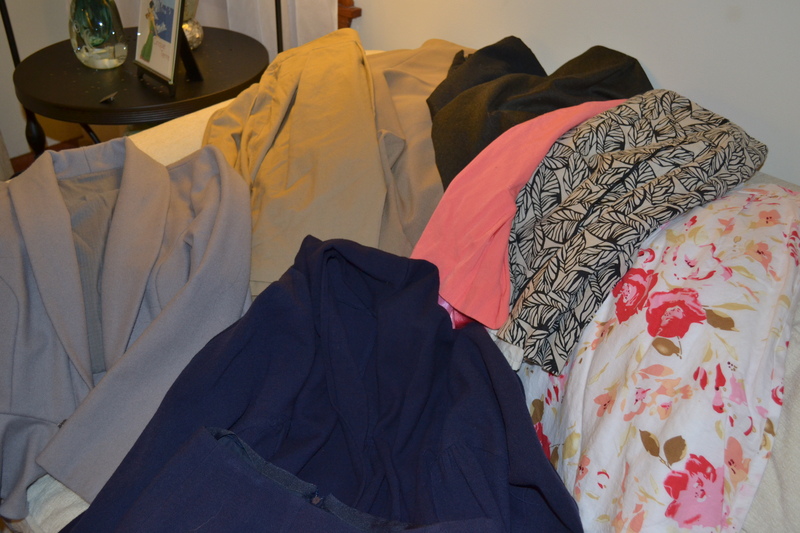 Bags, jackets and skirts. 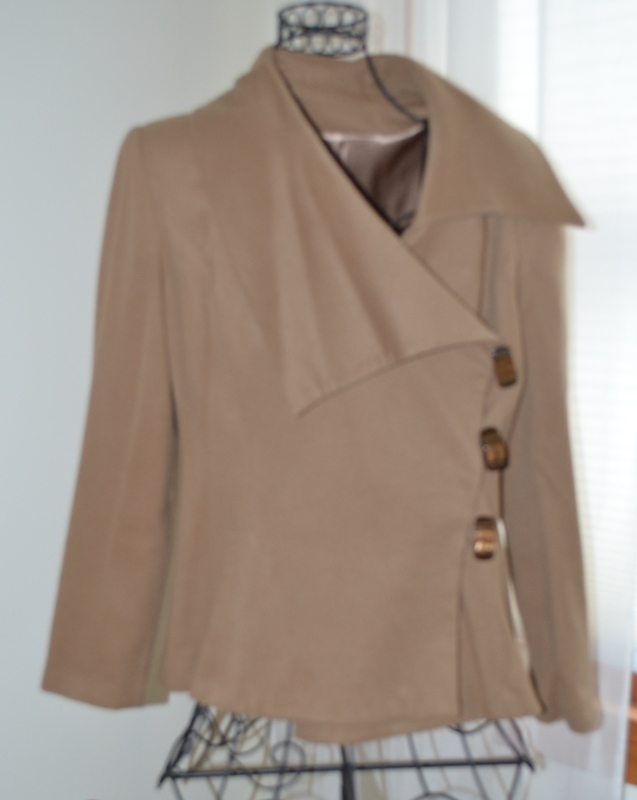 One of the first items I made when I returned to sewing about 5 years ago was a camel hair jacket. 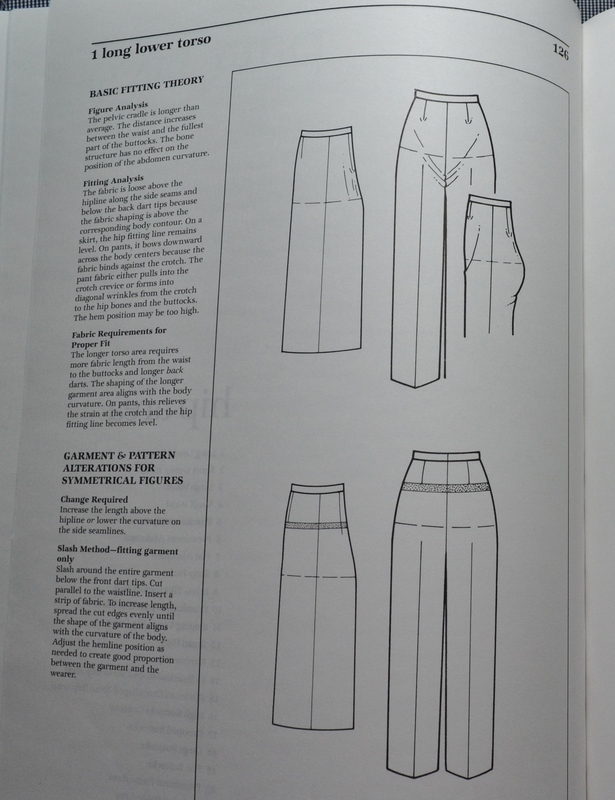 I was clueless about what was needed for tailoring and structure and it shows. 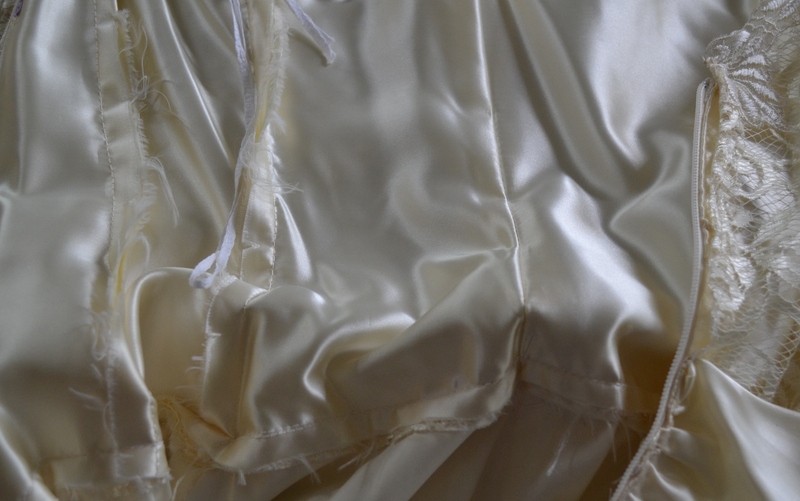 Beautiful fabric, but sad construction. It had no joy. 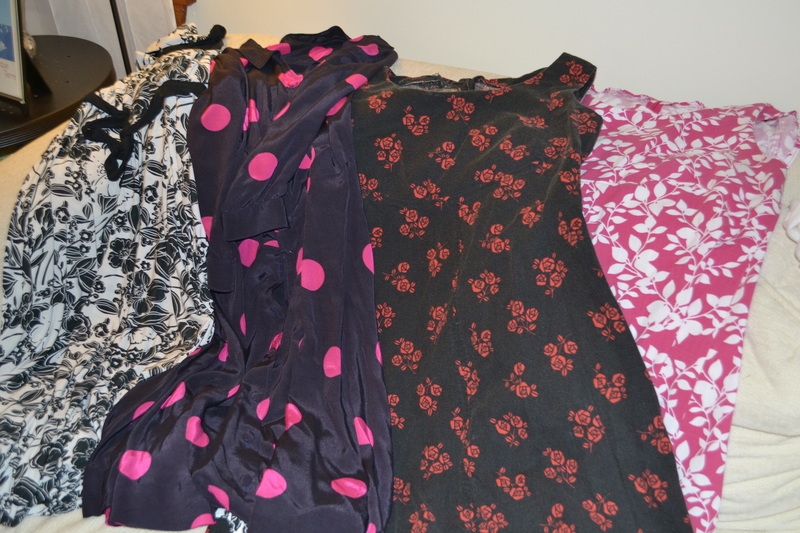 The dresses included two that were showing wear and the disappointing clown inspired polka dot dress which was never worn. 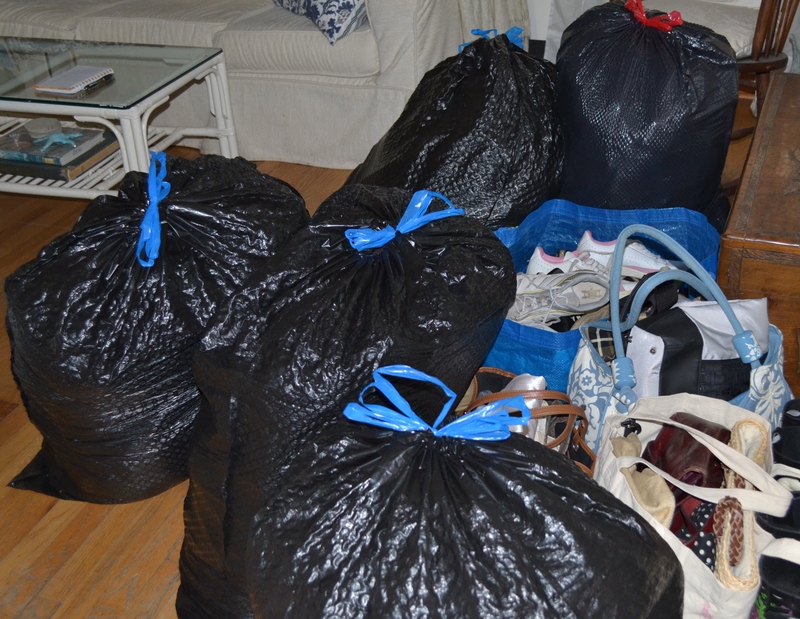 I barely had room in the car for all I took to Goodwill and gratefully said goodbye to my excess. 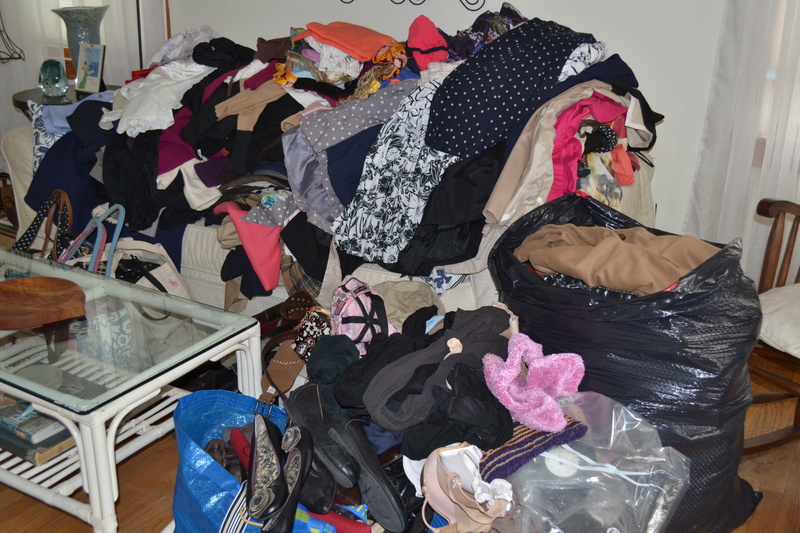 On March 31, this is how my tidy closet looked. 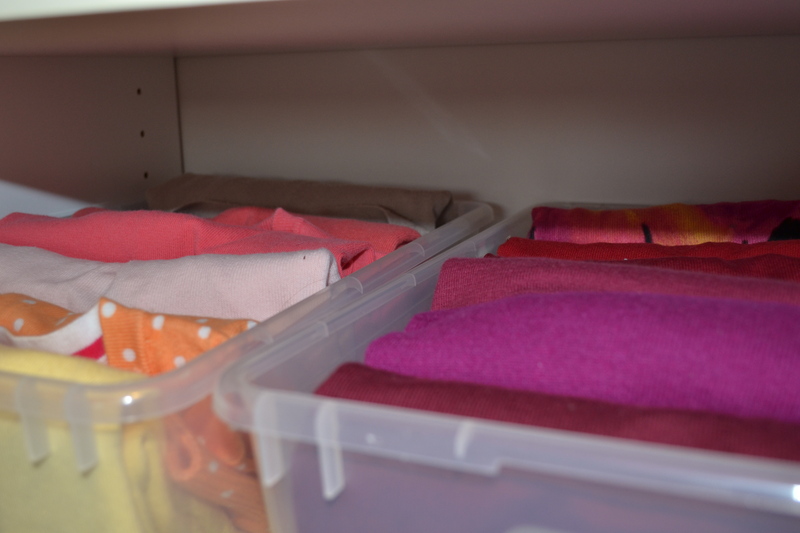 I used to have a jumble of shoes on the floor and a mass of sweaters on the shelves. One month later, it still looks like this. Yes, this gives me joy. 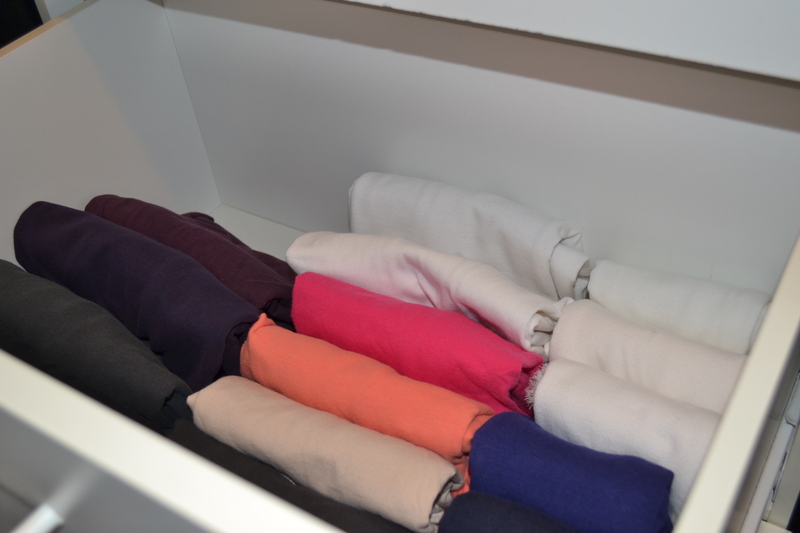 The KonMari method for folding clothes has you fold them into rectangles and store them vertically, not stacked on top of each other. It actually makes for much less wrinkling and you can see everything. 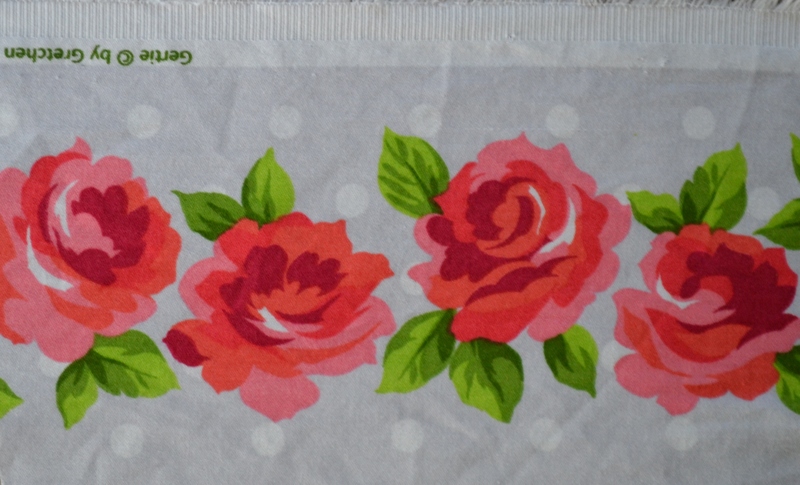 Maybe going slightly out of order, I’ve also completed the household linens and all the kitchen related items. 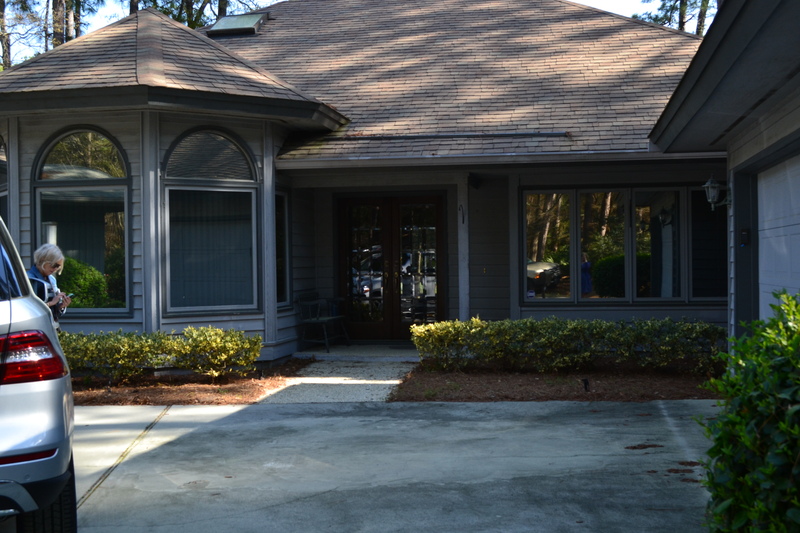 The house is starting to seem lighter and more open and I do not miss anything I have eliminated. The sewing room came next. 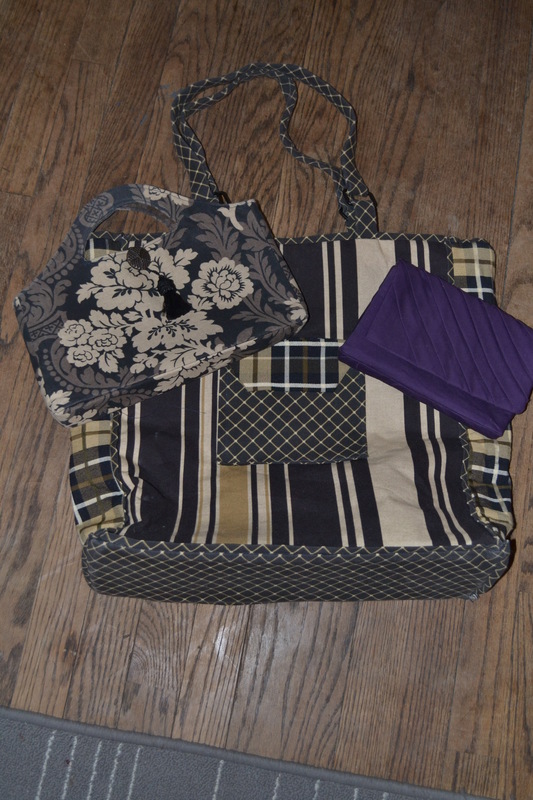 All my fabric went into one pile, including a bunch of upholstery samples I got at work and just stuck away. 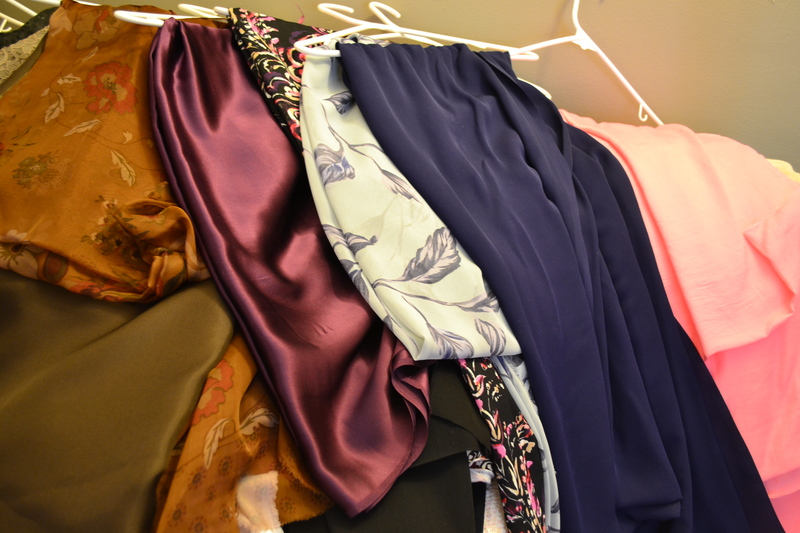 I forgot I had these silks because the closet was too full. 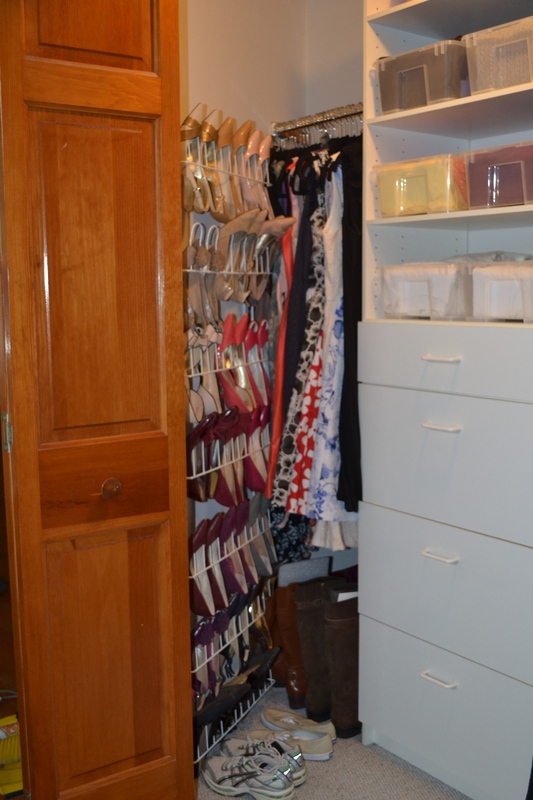 I had the closet stuffed, plus home dec fabric in a large wicker chest. It was hard to see what I had. 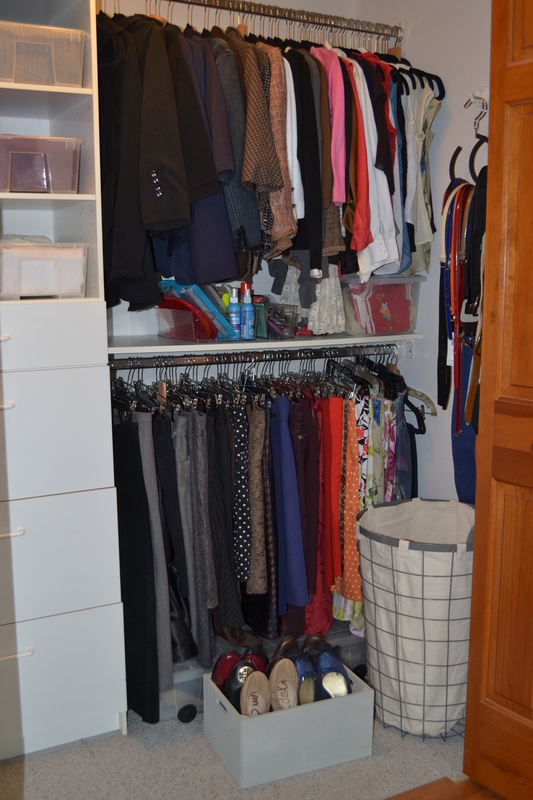 After determining what I really wanted to keep, everything could fit in the closet and I can see it all. 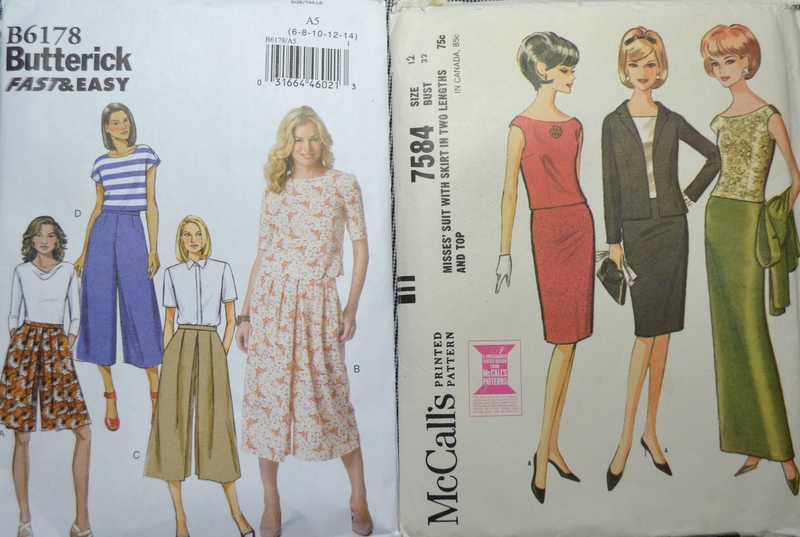 The eliminated fabric, plus 50 patterns from my stash has been donated to the American Sewing Guild to use in some of their charity sewing. 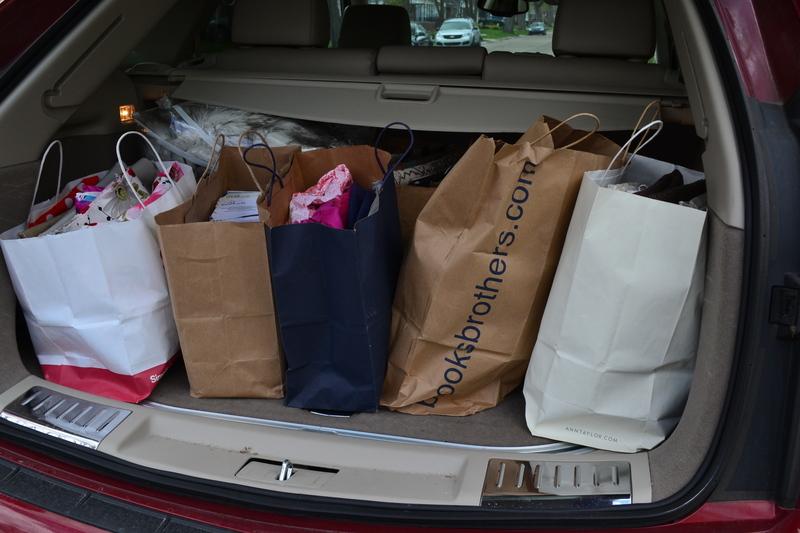 Eight shopping bags filled the back of my car. It can take up to 6 months to get through you whole house with this method. Right now I am working on books. I was able to greatly reduce my amount of books, with the exception of my sewing and fashion books. Those bring me much joy, so I kept them all but one. 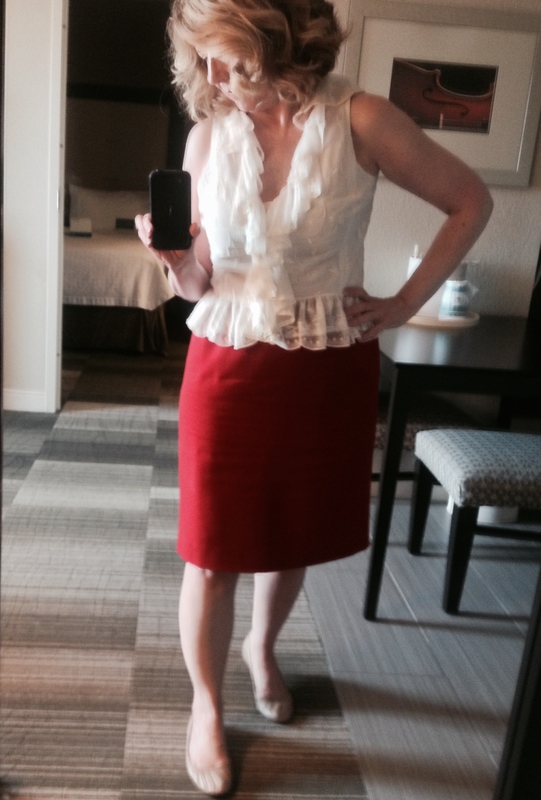 Logically, when planning a vacation wardrobe, it is a good idea to coordinate pieces around one main color, with some compatible secondary colors. After a long, dreary, cold, gray winter, logic was not invited on this vacation. 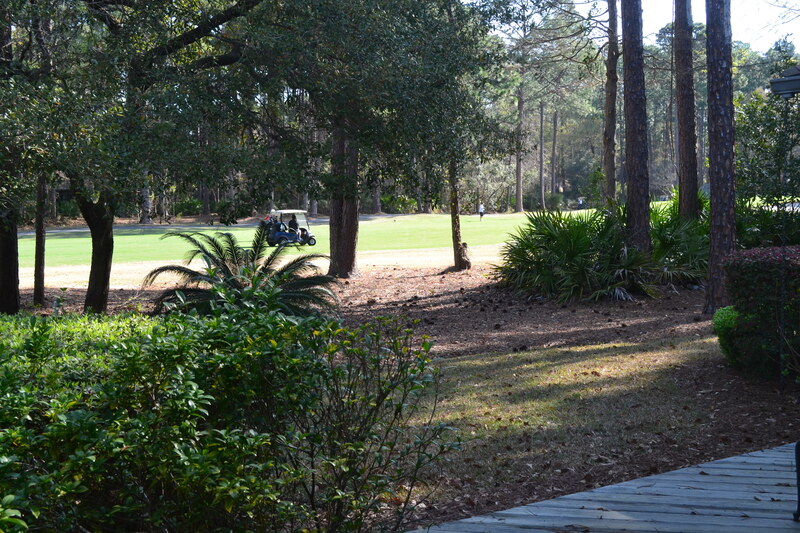 Hilton Head, South Carolina can still be a little cool in March, but it was warm and sunny enough to chase away the blues of a Michigan winter. 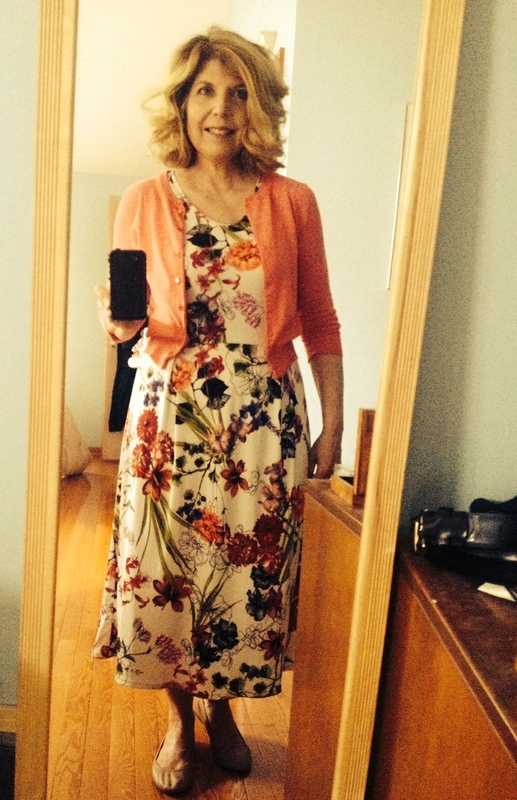 I wanted pretty colors and florals, no shoes that went with everything and no mix and match anything. As for tops, well there is always white. 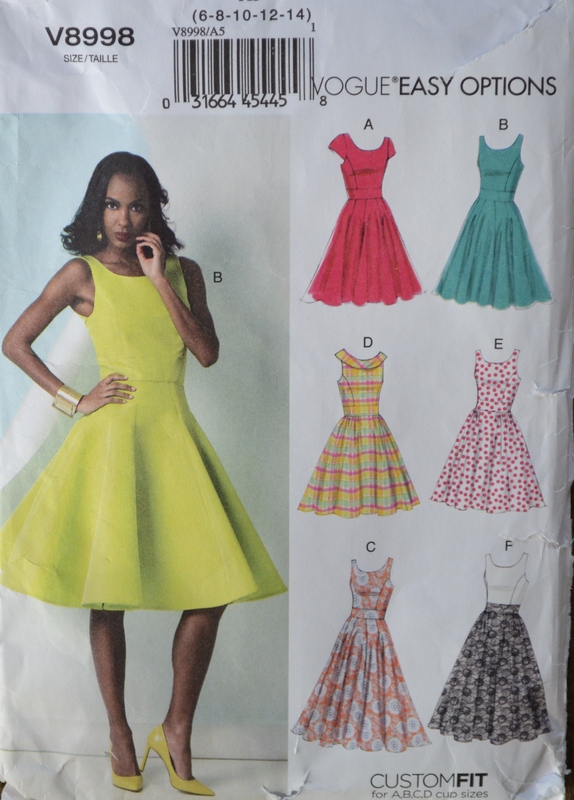 I used this Burda skirt pattern from the Spring 2014 magazine last year, sewing two skirts at the same time, assembly line style, as blogged here. 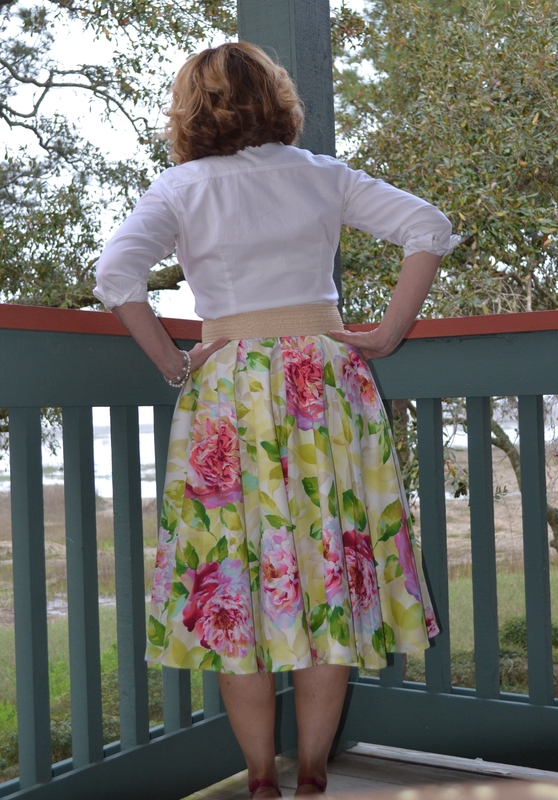 https://sewingforward.com/2014/04/29/assembly-line-skirts/ It’s an easy, unlined skirt with a back zip and slightly curved waistband. Since leaving my job and no longer sitting for 8 hours a day, I’ve lost a little weight and needed to adjust the pattern. 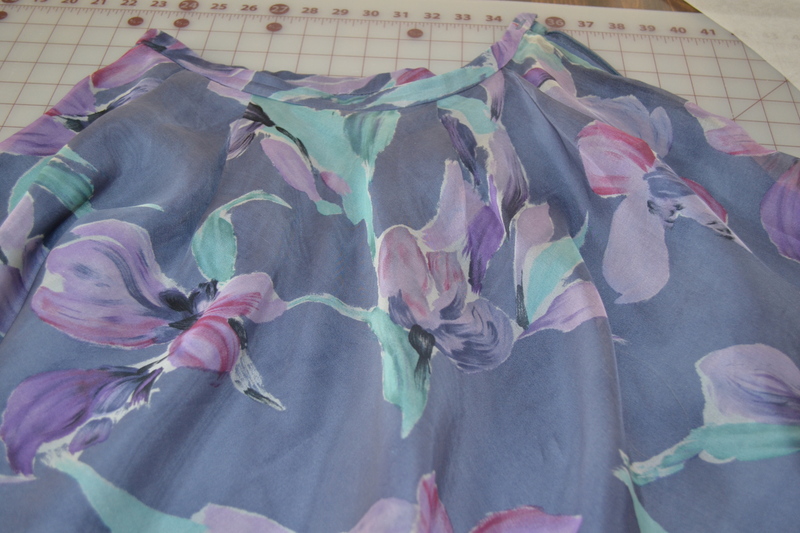 It was easy to change, I just cut off 1/4 inch from the center and side seams. 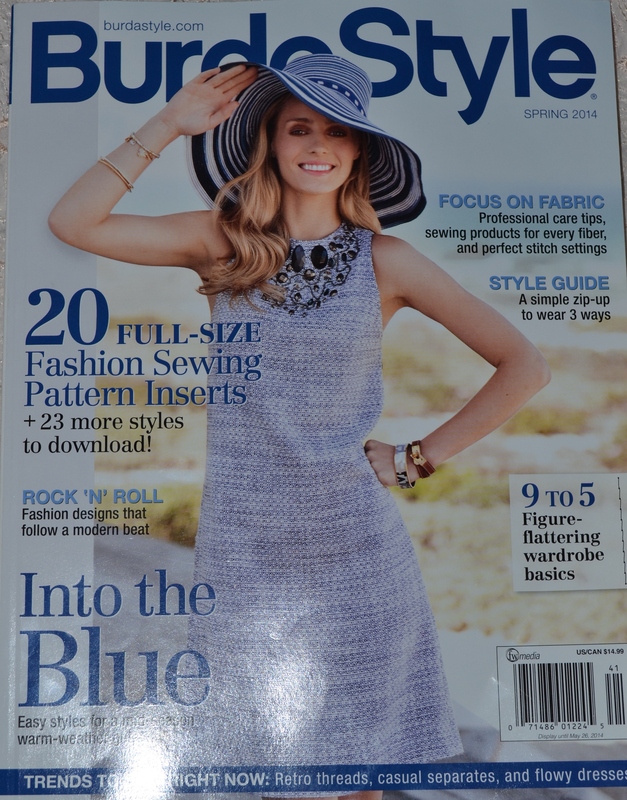 A little top stitching makes this appear almost like printed denim. 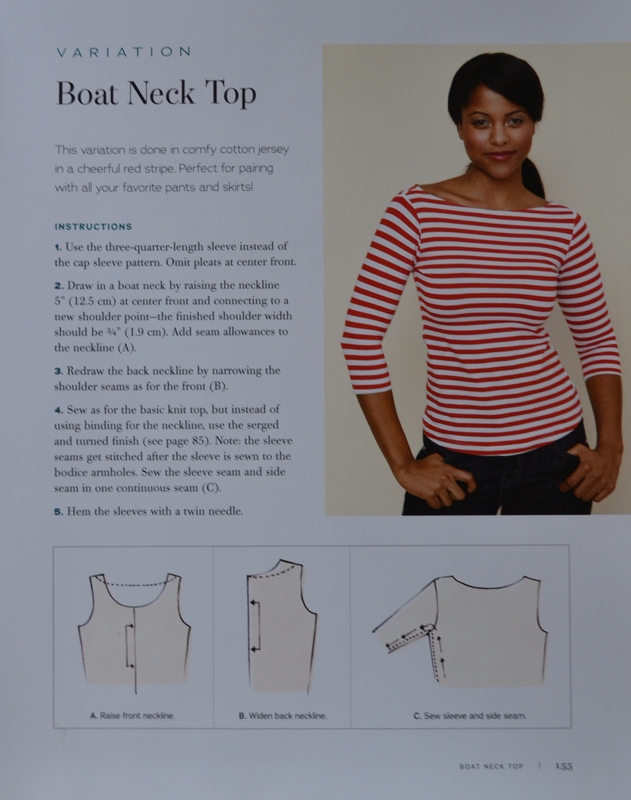 The white top was a quick make using the boat neck top pattern from Gertie Sews Vintage Casual. I used a very soft knit and can see getting lots of wear from this. I’ve already made it in another color and will likely make a couple sleeveless versions for summer. 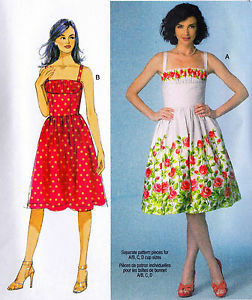 This is a fast and easy pattern with great results. 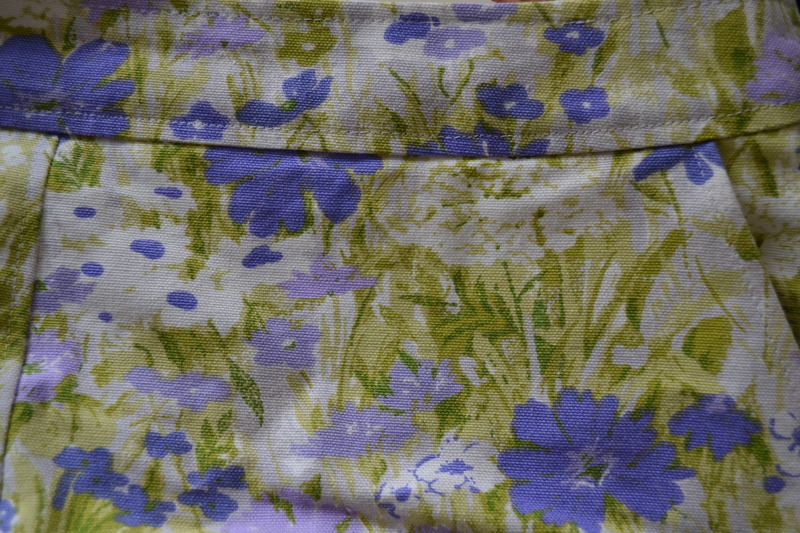 The cornflower blue floral is actually a home dec fabric by Waverly, which I picked up at Satin Moon in San Francisco. 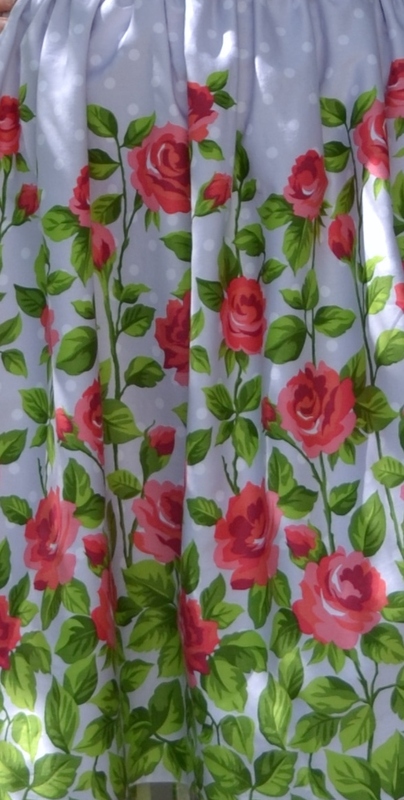 I don’t usually even look at home dec fabric because I’m afraid of looking like a Von Trapp singer wearing the curtains, but I really wanted something for spring. 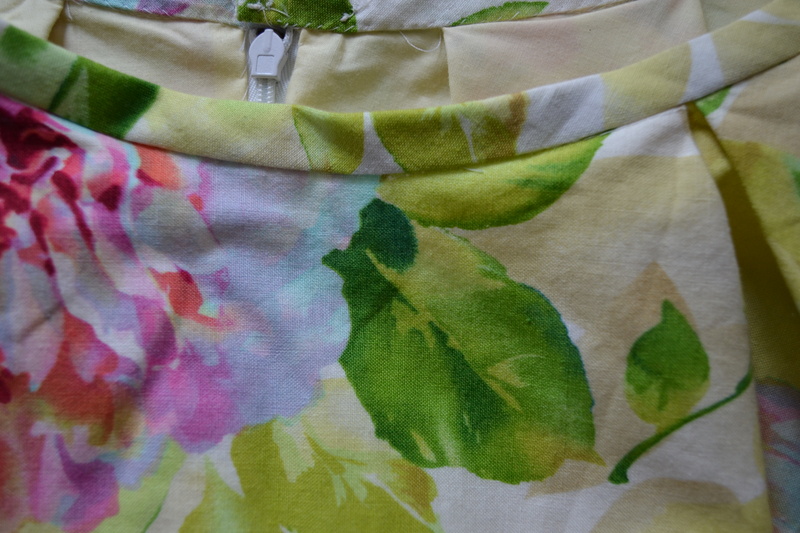 The fabric for my second vacation skirt was also from Satin Moon, another floral. This one is by Amy Butler. 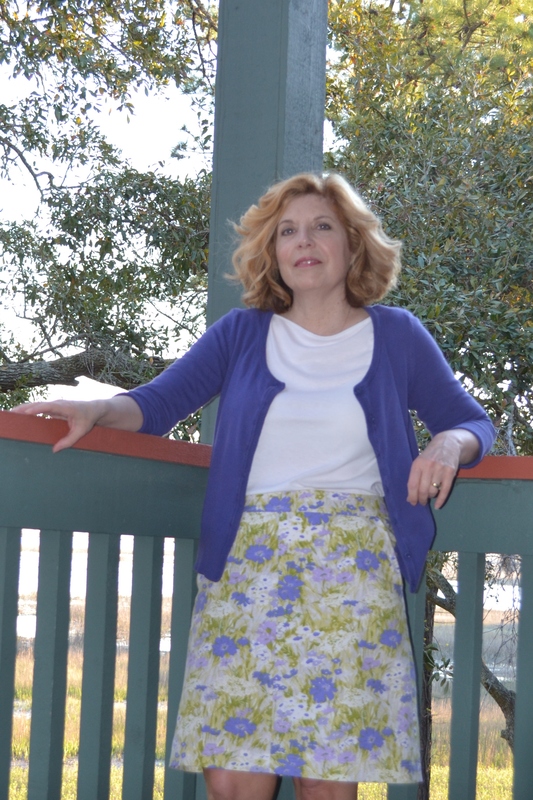 Both these fabrics wash beautifully and resist wrinkles, a plus on vacation (not that I did any wash there).The top is just a Target t-shirt, the scarf I found in Hilton Head. 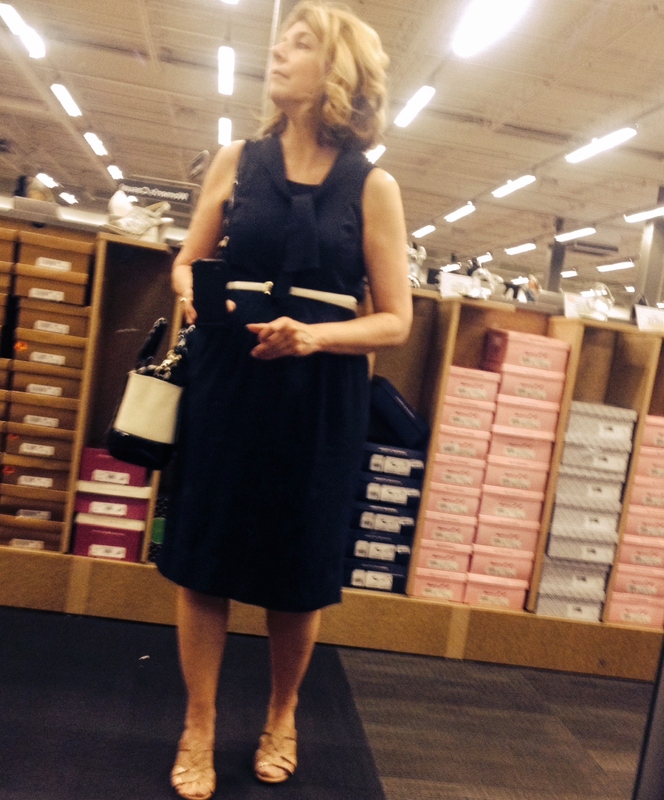 Shopping as you travel is a good option when planning an uncoordinated wardrobe. 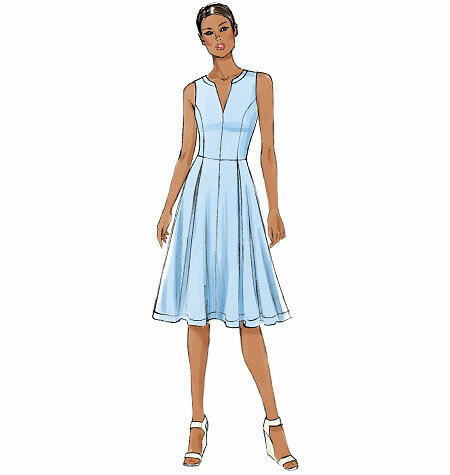 The pattern is actually part of a dress, Vogue 8993. 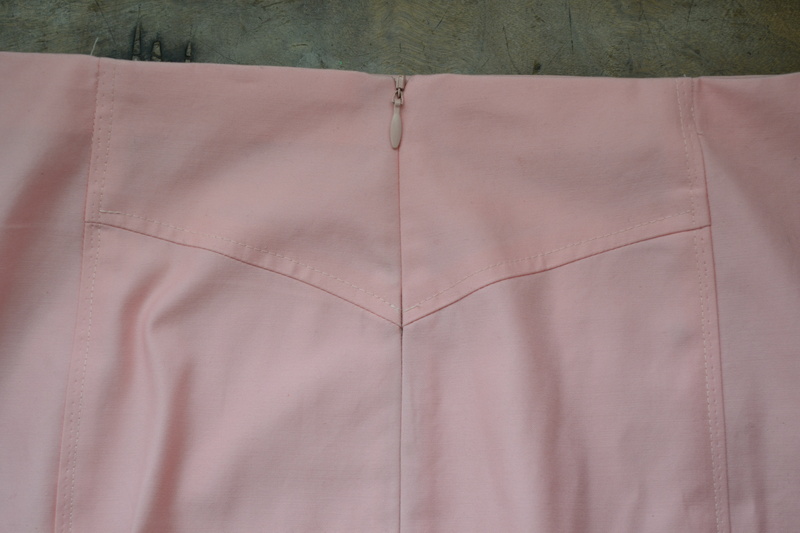 To make the skirt, I placed the center front on the fold, eliminating the center seam. 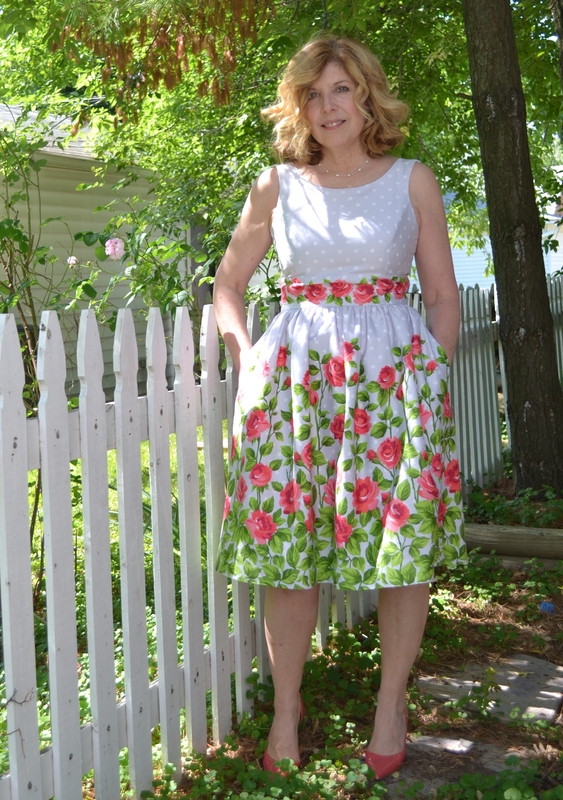 Instead of a waist band, I faced it with petersham ribbon and skipped the pleats in the back due to lack of yardage. 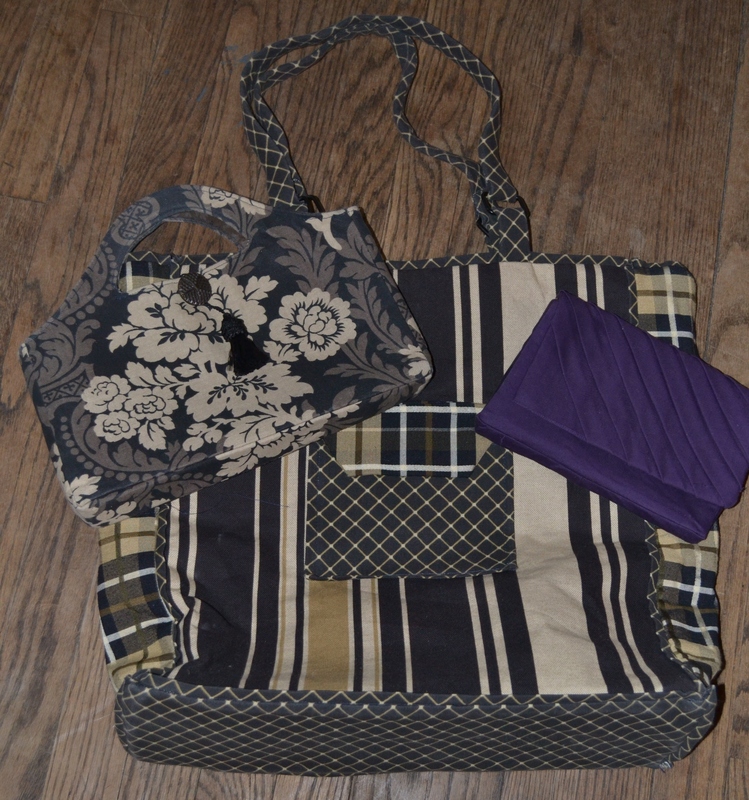 The pocket bags are made from white cotton left from another project. 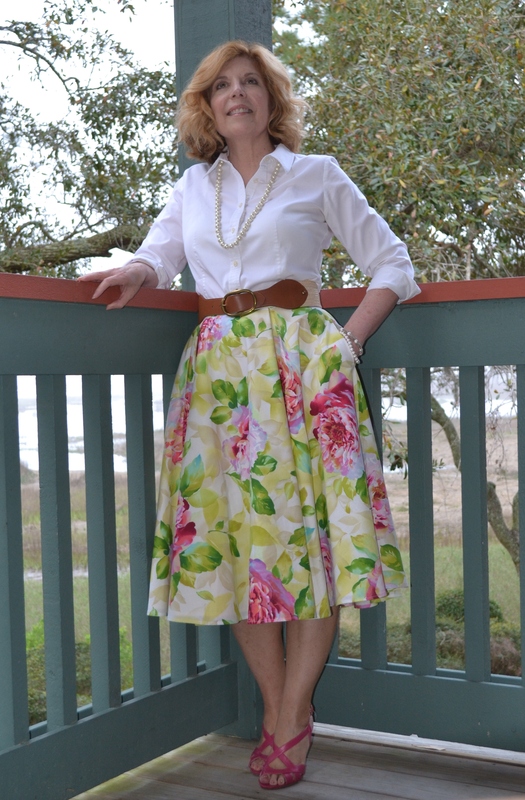 Skirt three is my favorite. 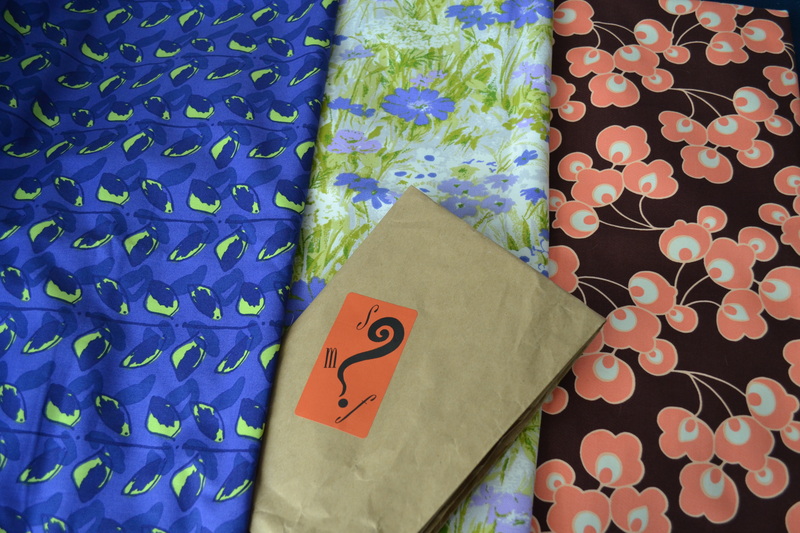 I saw the cotton print on a quick trip to Haberman Fabrics for skirt two’s petersham ribbon. The giant peonies just shouted, “Winter is over!” Peonies will always remind me of my grandmother’s garden, of course these did not have the ants crawling all over them. What is it with peonies and ants? 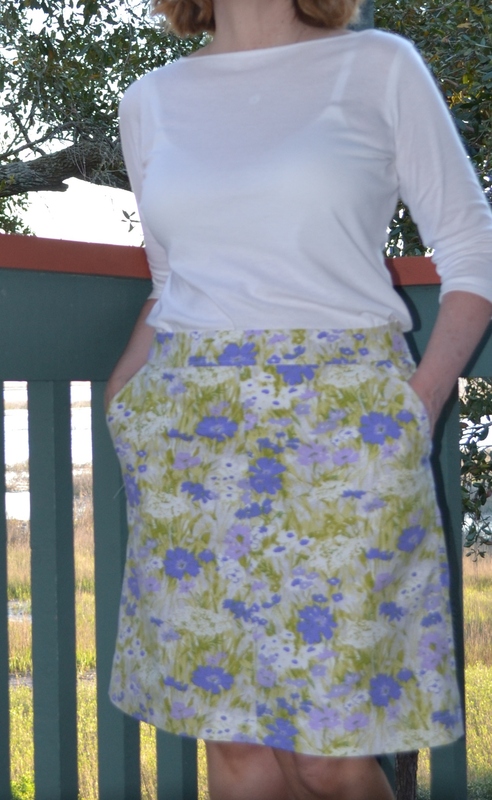 The skirt is almost a full circle and lined with a cotton blend I had in the stash. The little girl in me wants to twirl around in it, the middle aged mom reminds me I would likely not look cute showing off my undies. 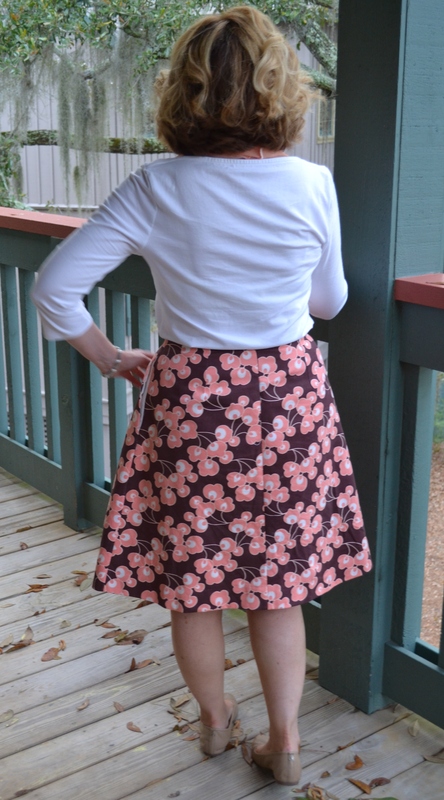 I used a favorite ready to wear skirt to trace off a pattern. 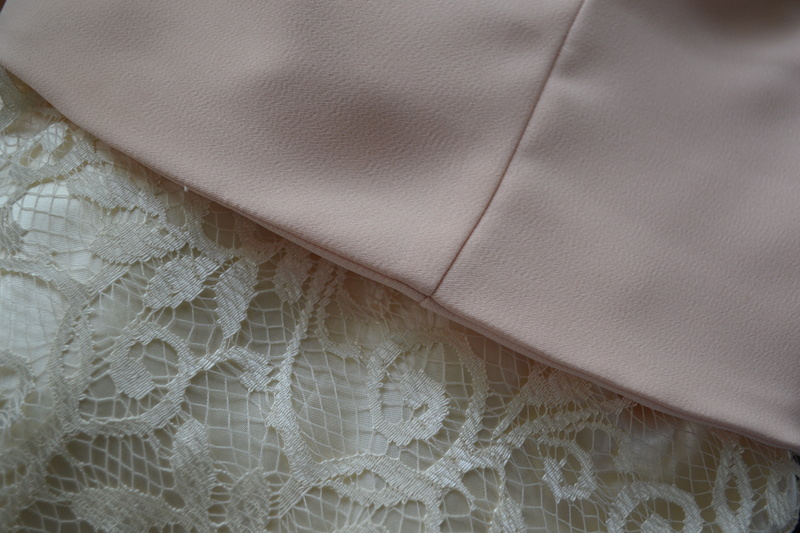 The front and back are almost the same, but the back has a center seam to allow for the zipper placement. 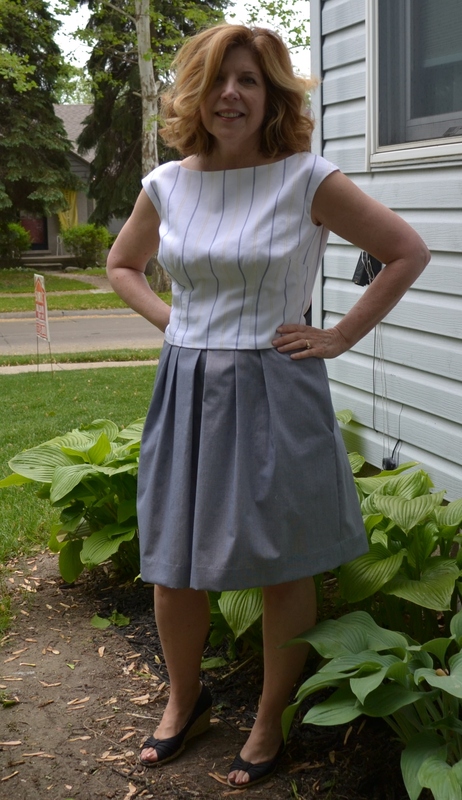 The only area to fit was the waist and the large pleats (2 front, 2 back) allowed for some adjusting. 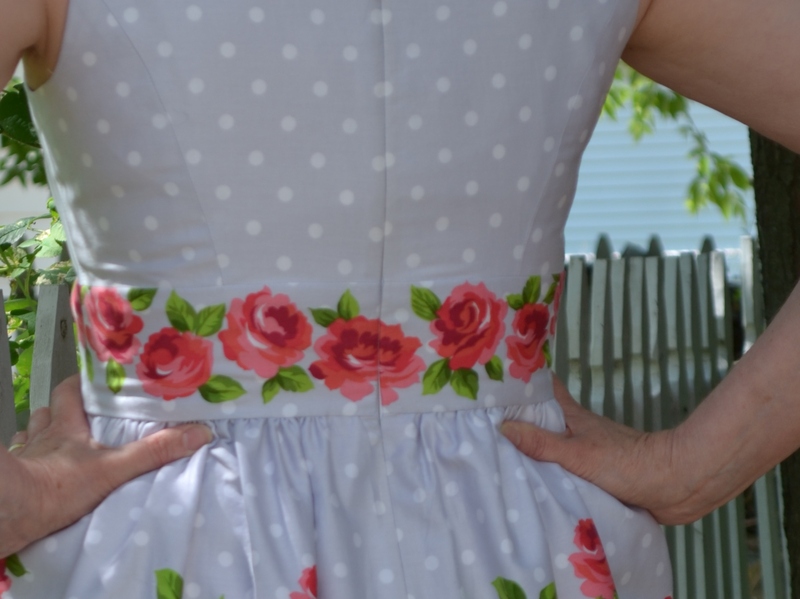 The waist band is just a narrow strip cut on the bias. Another easy make. 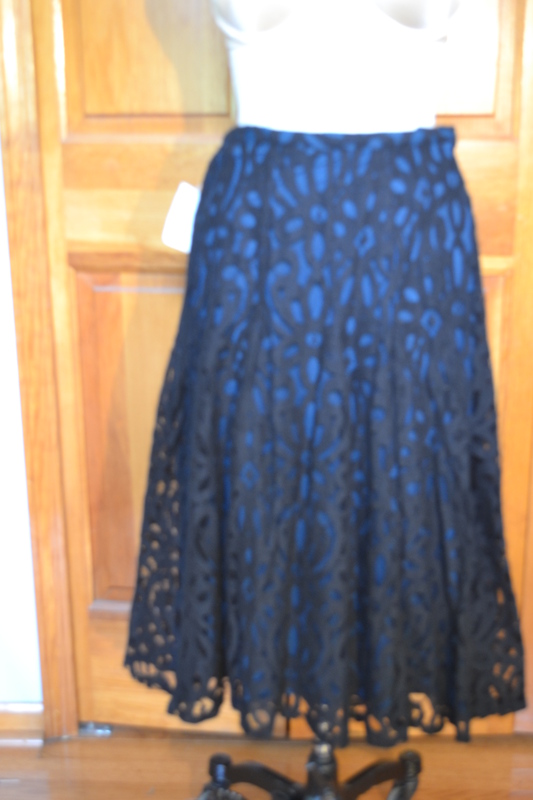 Besides my new skirts, I also took dresses made last summer, never wore anything twice and managed to get it all in one within the weight limit suitcase. 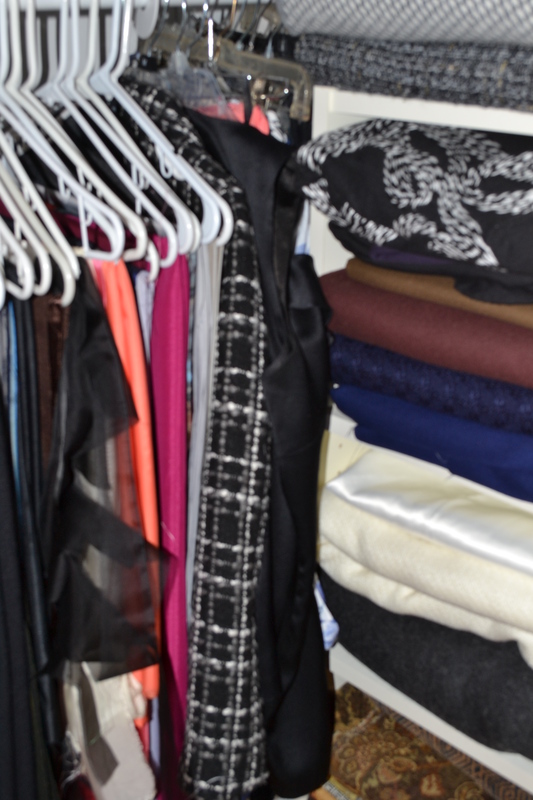 The advantages of warm weather packing. And what was I looking at off that balcony? 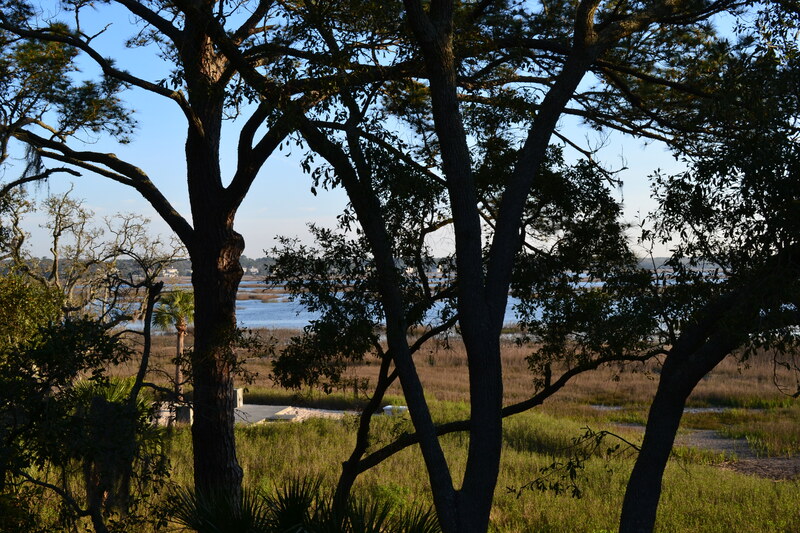 The view of a lovely Carolina salt marsh, so peaceful and pretty. It changes throughout the day, with the tides and light. 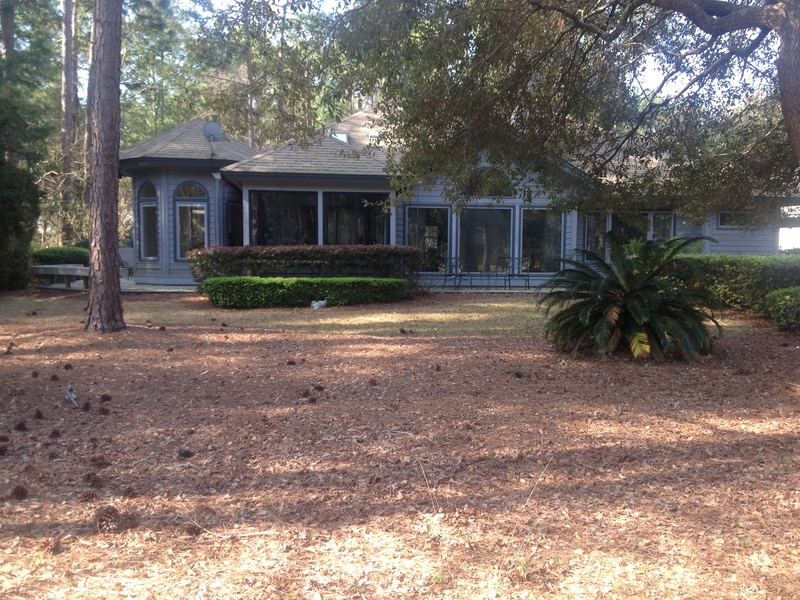 After vacationing in Hilton Head for 15 years, we bought the ultimate souvenir –a house. It will be a few years before we move there, but for now I’m getting obsessed with decorating ideas and trying to figure out where I’ll put all my sewing stuff. My husband won out of the view, it’s on a golf course. 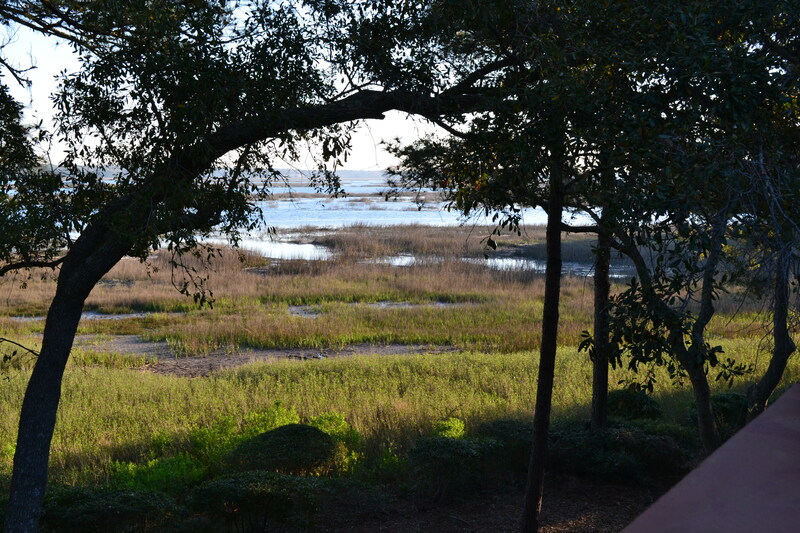 I’ll just need to find a really large painting of a salt marsh to hang in the living room.